The Blogger who tried ALL the Pumpkin Spice. I’m just going to get right to it. I love Pumpkin Spice. (What? You guessed that?) Always have. You know when imagine those people in marketing meetings saying “Who cares what it is- slap a pumpkin spice label on there and people will buy it!” They’re talking about me. I’m the people. And I did something this season that I’ve wanted to do every year on this blog. Buy ALL THE PUMPKIN THINGS. I have to say, though, I feel like I have a knack for great grocery store finds and I started an Instagram account just to share stuff like that. You can follow it, here! I’ll post limited edition holiday products, but also great all-around things you might want to pick up on your next grocery trip. Now. Here’s my very scientific rating scale for the things I tried. There were a few things I didn’t open, just because I didn’t want to be wasteful. I chose to include them in gift boxes, donate, or pass along to friends! Heck yes: Love it, want it, find it, buy it. Pretty Good: Tasty, but not the BEST thing I’ve ever eaten. Just Okay: Meh. Not memorable, but not horrible. I’ve placed a * next to anything that I think is extra delicious in a given category, and when you see pink text, those things are linked so you can find them online if you’d like to. 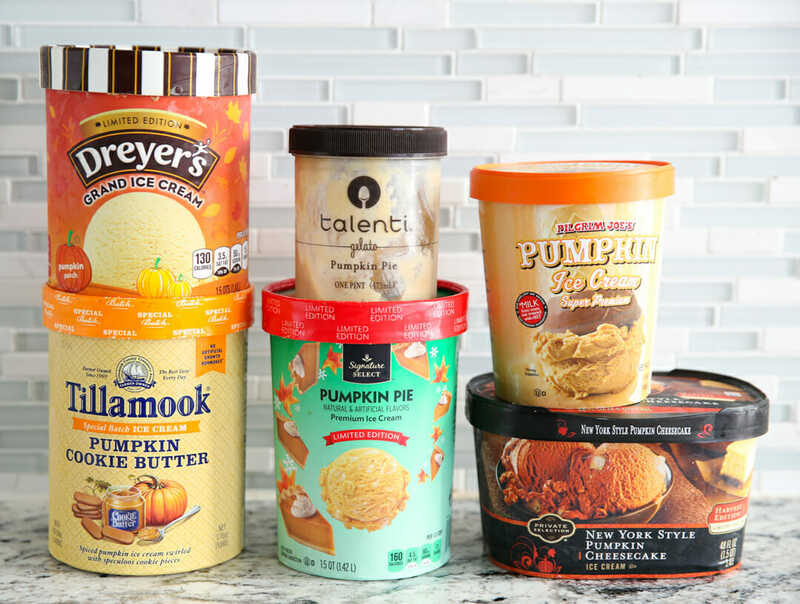 I had several friends come over and blind taste-test these ice creams, but it told me one thing; everyone has a different preference when it comes to pumpkin spice. They ALL had different top choices! So I’ll just rate them according to my own taste and try to explain the flavor as best I can. Every one of these ice creams are good, it was only after tasting them all and comparing them back to back that it was easy to tell where some were lacking. Dreyers Pumpkin Patch: Pretty Good. Fairly mild flavor, but good crowd-pleaser. Tillamook Pumpkin Cookie Butter: Heck Yes. Has the most unique flavor but every tester loved the creamy texture and cookie chunks. My husband’s #1 pick. Talenti Pumpkin Pie Gelato: Heck Yes. The only flavors in this are pumpkin and nutmeg, so if you like nutmeg, you’ll love this. Tasted like pie ala mode. Albertson’s Signature Select: Heck Yes. This was a very surprise favorite for me. I actually ranked it on top! This has swirls of cream and big chunks of pie crust. It’s super creamy and has a very traditional, classic pumpkin pie flavor. Trader Joe’s Pumpkin Ice Cream: Pretty Good. A couple people chose this as their top choice. I thought it tasted very distinctly like egg nog. Private Selection Pumpkin Cheesecake: Just Okay. This was a surprising LOW ranker. I love Private Selection; I’m a huge fan of their ice cream. If you taste this all by itself you’ll probably love it (I did) but when compared to all of the others it was incredibly bland. Ben & Jerry’s Pumpkin Cheesecake: (not pictured) Heck Yes. from my memories of year’s past! DQ Pumpkin Pie Blizzard (not pictured) Heck Yes! Trader Joes Pumpkin O’s: Pretty Good. lighter, crispier & milder than the Cheerios. Pumpkin Spice Life: Just Okay. Very tasty, but not enough pumpkin flavor for me. Pumpkin Spice Special K: Pretty Good. Would get a heck yes if the amount of pumpkin spice yogurt balls was quadrupled. Pumpkin Spice Mini Wheats: Just Okay. Not enough pumpkin flavor for me. *Noosa: Heck Yes. Heck Yes. Heck Yes. You could basically put this in a pie crust. Dannon Light & Fit Greek: My 6 year old ate this one before I could try it! Kodiak Cakes Chocolate Pumpkin Minute-Muffin: Heck Yes. Trader Joe’s Organic Toaster Pastries: Pretty Good. Quaker Pumpkin Spice Oatmeal: Just realized I forgot to try this. Stay Tuned. *Belvita Pumpkin Spice: Heck Yes. Love these so much. Pumpkin Pie Pop Tarts: Pretty Good. I liked the Trader Joes one better. Pumpkin Spice Granola: Didn’t open this yet! Sunbelt Granola Bars: Just okay. Not super pumpkin-spice-y though. Kind Bar Caramel Almond Pumpkin Spice: Heck Yes. BUT, doesn’t taste significantly pumpkin-spicy. Mostly just really great nuts and caramel and cinnamon. But still tastes fantastic so I gave it a heck yes. But if you’re expecting pumpkin spice you’ll be disappointed. Special K Pastry Crisps: Pretty Good! Think Thin Bar, Pumpkin Spice: Blech I didn’t like these at all. Little Debbie Caramel Apple Oatmeal Cream Pies: Pretty Good. Taste a lot like regular oatmeal cream pies. *Hostess Pumpkin Spice Cupcakes: Pretty Good! FOR a Hostess Cupcake, ya know? Surprisingly tasty. It’s still a Hostess Cupcake, but I was pleasantly surprised. Honestly almost rated these as Heck Yes. Hostess Caramel Apple Cupcakes: Pretty Good! Again, relatively speaking. My family loved these ones. Little Debbie Pumpkin Spice Rolls: Blech. Didn’t like these. Hostess Pumpkin Spice Twinkies: Pretty Good. Not afraid to say it. I totally liked the Twinkies. Pepperidge Farm Pumpkin Cheesecake Cookies: Just Okay. Wouldn’t buy them again. Pepperidge Farm Pumpkin Spice Milanos: Pretty Good. I have yet to meet a Milano I didn’t get along with. Pumpkin Spice Wafer Cookies (Winco): Heck Yes! I have these in Apple Spice as well, and they are both REALLY good! I love love wafer cookies. Pumpkin Spice Fudge Stripes: Haven’t actually opened these yet. Pumpkin Spice Oreos: Heck Yes. TJ’s Pumpkin Biscotti: Have any of you tried this one yet? TJ’s Pumpkin Joe-Joe’s: Heck Yes. These have a very strong Ginger flavor, the Oreos are definitely more of a traditional pumpkin spice flavor. *Mrs. Thinsters Cookie Thins: HECK YES x 10. Love these. Gluten Free Pumpkin Spice Cookies (Target): Pretty Good. FOR a gluten free cookie. They are very soft, but do have kind of a funny texture thing at the end. But I’m assuming people that eat gluten free are kind of used to that. Flavor is great. Pumpkin Spice Lindor Truffles: Pretty Good. I thought the chocolate overpowered the pumpkin spice filling. I was a little underwhelmed. Pumpkin Spice Caramel Ghirardelli Squares: Just Okay. Again, not much of a pumpkin spice flavor comes through. Pumpkin Seed Bark Thins: Heck Yes. Not pumpkin spice flavored, but I do love the crunchy little seeds. I’m a big fan of all the Bark Thins. TJ’s Pumpkin Spice Salted Caramels: Heck Yes. To be fair, my husband hates these. But I happen to love them. They’re very dark with a hefty sprinkle of salt. *Pumpkin Seed Brittle: HECK YES x 1000. If you buy one pumpkin spice thing at TJ’s, let it be this. Pumpkin Spice Kisses: Pretty Good! Pumpkin Pie Toaster Strudel: Heck Yes. I’ll take a strudel over a pop-tart any day. TJ’s Pumpkin Waffles: HECK YES. Fluffy, flavorful, delicious with cinnamon-butter. We love these. *Pumpkin Caramel Danish (TJ’s): HECK YES. These freeze beautifully, grab some for holiday breakfasts! Soooo good. Thomas English Muffins (Salted Caramel and Pumpkin Spice): Just Okay. Franz Pumpkin Spice Bread: Just Okay. Tastes like regular ol’ cinnamon bread. TJ’s Pumpkin Rolls: Just Okay. Not bad, but tastes very tub-o-dough-like. TJ’s Pumpkin Spice Caramel Corn: Heck Yes. 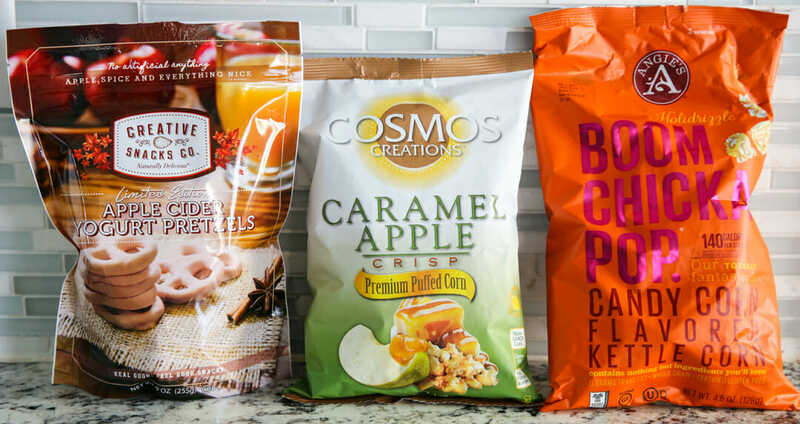 Angies Boom Chicka Pop Pumpkin Spice Kettle Corn: HECK YES. I am COMPLETELY in love with both this one, and the candy corn version below. I wasn’t able to find these in-store, so I ordered from their website! Pumpkin Spice Yogurt Pretzels (Target) Heck Yes. These were a surprise hit. Loved both these ones, and the apple cider ones below. Apple Cider Yogurt Pretzels: Heck Yes. Loved these! Great apple flavor. Caramel Apple Cosmos Creations: Heck Yes. Cosmos can do no wrong in my book. Candy Corn Boom Chicka Pop: Heck Yes. Better than I expected. SO good. Candy Corn Hershey’s: Just Okay. Candy Corn M&M’s: Just Okay/Blech. Not a fan. Hershey’s Caramel Apple Chocolates: Pretty Good! Caramel Apple Milky Way: Pretty Good! TJ’s Maple Leaf Cookies: Heck Yes. Although I wish the cookie part was more buttery. Apple Crisp Wafer Cookies (Winco): Heck Yes. Loved these! Candy Corn Oreo’s: Meh. Not a huge fan of these. You guys MUST leave me a comment if I’ve missed anything I need to try! Tell me what your favorites are! AND I’ve taken a lot of yummy stuff and packed them lovingly into some gift boxes and I want to send one to YOU, and YOU, and ALL OF YOU! But I can’t. I have a few though. THREE chances to win! 1. Use this Rafflecopter and then leave a comment telling me about your Favorite Pumpkin Spice flavored thing- recipe, limited edition, whatever. 2. SHARE the post on our Facebook page. I’m going to pick one winner just from people who share the post from Facebook, it’s pinned to the top of the page, here! 3. I’m also going to pick another winner from THIS Instagram account. Follow and stay tuned for giveaway post! and now enter to win! Need Pumpkin Recipes to try?? Click Here for Pumpkin Central! *This post contains affiliate links. To learn more about them, click here. Wow! This is awesome. I love Little Debbie’s Pumpkin Delights. You should try them out! I am so excited to try those wafer cookie flavors. Those cookies are my favorite. Also excited to try the Toaster Strudels. I also bought the pumpkin spice Kisses, my husband and I both didn’t like them. But my brother came over and pigged out and ate them all in one day. So like you said, everyone has different tastes. Thanks for posting this, it was fun, and I’m excited to try some new things. I love the pumpkin pie frozen yogurt at Maverick (convience store) when it’s available. AND I haven’t tried it yet but friends tell me that pumpkin spice coffeemate is amazing (put it in hot chocolate if you’re not a coffee drinker like me). What a great idea trying EVERYTHING pumpkin. I would have enjoyed taste testing with you! I LOVE LOVE LOVE all things pumpkin. The oreos are surprisingly delicious. I love pumpkin spice ice cream! I’m bummed to hear that you didn’t like the private selection ice cream very much. I just bought some of that, because I love their ice cream. It is pretty much my favorite. I also bought some of the Tillamook, and I am excited to try that! Stupid Trader Joe’s has replaced a lot of the sugar and corn syrup in their products with brown rice syrup, and I am allergic to rice, of all things. So every year, there are fewer of their products that I can actually eat. Which is great for my waistline but sad for my mouth! 🙂 I am dying to try the boom chicka pop. Those sound so good! Pumpkin pie blizzards are a family fave! woah.. I don’t even know where to start. Usually I don’t buy anything pumpkin flavored (except pumpkin puree) b/c I’m afraid it will taste too artificial. I wish we had a trader joe’s nearby. You’ve intrigued me with the tillamook and kettle corn though… I’ll have to try those. I make mini pumpkin loaves every fall that are to die for. I will be making my way to the grocery store to try the Pumpkin Pie ice cream very soon! WOW! That was one of the most amazing posts! 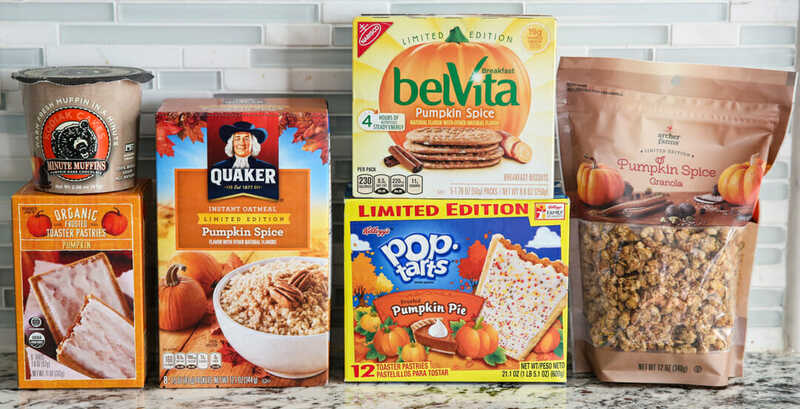 So excited to see products I’ve never seen before – BelVita Pumpkin Spice, I’m talking to you! I’ve been eyeing some of the products you’ve listed, so it looks like shopping day is going to be extra fun tomorrow. My favorite is homemade pumpkin muffins with double the spice, but since we are talking commercially prepared it has to be tillamook ice cream (don’t try their lemon bars – you’ve been warned) with a close second from chobani flips. I love Costco’s pumpkin streusel muffins! I love the Pumpkin Spice Milanos and Starbucks Caramel Apple Spice drink, yum! What a fun idea! I had no idea pumpkin spice reached so far. Can’t wait to try some of these! Love this post! Two more Trader Joe’s favorites: Iced Pumpkin Scone Cookies and pumpkin bagels. I love pumpkin chocolate chip cookies! I tried (and loved!) the Apple Spice wafers, but now I’ll have to get the PS ones! And a trip to TJ’s is DEFINITELY in order. I had a mild-yet-delightful PS sugar cookie from a Holiday Gas Station the other day, and I’m currently looking for a copycat recipe. Let me know if you find one! ? I was not aware of all these pumpkin products. Wow. My family is crazy for Entenmanns Pumpkin donuts. Their Apple Cider donuts are awesome too. I love so many pumpkin flavored things too, but I think my mom’s pumpkin & walnut cookies are my favorite! I know you said you were underwhelmed by them, but I am an obsessed, I mean huge Lindor truffle fan and so badly want to try those now! So you post DietBet last week and now you post this?!?! I see how it is 🙂 I’m actually not a huge pumpkin fan, but once in a while, I try something pumpkiny that makes me rethink that. So maybe if I win this, I’ll find some more like that. I think the pumpkin brittle and the Kind bar would be good, I’d love to try the pumpkin waffle things, and we lover wafer cookies here too- I’ve never even seen them in pumpkin. The cookie thins from Target look yummy too. Love the Pumpkin spice Belvitas! TJ’s pumpkin cookie butter might be the yummiest thing I have ever put in my mouth! This was an epic blog post and I LOVED it. Now you definitely have to do it again for peppermint come Christmas time! My favorite is the traditional pumpkin pie with some pumpkin spice ice cream on the side – pumpkin glory in its best. I love homemade pumpkin muffins. My favorite ? What a fun idea to try all the flavor of fall! For anyone in the Boston area, Bedford Farms makes an amazing pumpkin based ice cream with Oreos and chocolate chunks in it called Monster Mash. It is my favorite ice cream of all time. Long time pumpkin spice lover here. Like before they made ALL the things pumpkin spice! I think you and I could be besties irl! Love this post! I loved Trader Joe’s pumpkin butter. I also like the General Mills pumpkin Cheerios. I was not a fan of the Trader Joe’s oatmeal or Quaker pumpkin flavored oatmeal. I love pumpkin spice muffins!! The pumpkin seed brittle from TJ’s is my FAVORITE!! I like pumpkin spice ice cream, though I am a popcorn nut, so I am sure I would love some pumpkin spick popcorn if I had ever tried it. Pumpkin spice yogurt pretzels are so good. I was going to walk right past those pumpkin spice oreos, but you definitely changed my mind! I often say to people that I’m *THAT* person that they make all things pumpkin spice for. They finally put a Trader Joe’s within an hour of me and my first visit was last fall when I went and bought EVERYTHING pumpkin spice I could find. My mother just had me try some pumpkin spice custard from a local place that makes their own….soooo good! Pumpkin spice soft serve/custard for the win! I love Trader Joe’s Pumpkin Jo Jo’s. And the surprise hit fonthe season… Pumpkin Cheerios. One thing I love thatI noticed you did not test is pumpkin spice coffee creamer. I love to add that to my hot chocolate. There is a gingerbread flavor that is super delicious as well! Love, Love, Love pumpkin spice!!! Thomas’ Pumpkin Spice Bagels! I think Panera (maybe Brueggers? I can’t remember) also makes a pumpkin spice bagel that is to live for! Basically pumpkin+carb = winning. Love Ben and Jerry’s pumpkin cheesecake I may have stocked up at Walmart and then hid them in the bottom of my freezer. :) this is such a fun post! Thanks for sharing! I LOVE the pumpkin cream cheese spread from Trader Joes! So Good! Love pumpkin spice, but I also am huge fan of maple sandwich cookies. You made we want to try everything! Love the Pumpkin Spice Cheerios. I love all kinds of pumpkin treats, but I would have to say my favorite is my mom’s homemade pumpkin pie (she cooks her own pumpkin-not canned!). Sooo good! I was trying to add my comment for the raffle but it was blank so I’m adding it here. I love Trader Joe’s pumpkin butter!!! Have you tried their pumpkin spice cookie butter and coffee?? Oh man…I’ve been unable to drive and walk around a grocery store due to a broken foot, so I’m living out my pumpkin spice dreams through blog posts this year. I’ve scheduled a shopping trip immediately after my next follow up appointment, when I should get out of the cast. One more week! I can vouch for the Hostess cupcakes! However, I thought the soft caramels were pretty good. Glad to know that I’m not the only one out there trying everything with the words Pumpkin Spice on it. How fun of you to do this! I LOVE the Chobani pumpkin crunch flips; ; when I bought them last year it was actually the first time I remember buying something that was commercialized pumpkin as I’ve always been more of a homemade pumpkin girl (pumpkin cheesecake, pumpkin bread, pumpkin waffles, etc). I love making pumpkin goods but now I’m itching to branch out and buy some more commercialized products. Know that you were not too keen on them or your review is not a rave regarding the Trader Joe breakfast pumpkin bars. I really have enjoyed them. I went a little pumpkin spice crazy at trader joes this week. I love the pumpkin herbal tea. Also, those caramels. Yesterday I made snickerdoodles with caramel bits in them rolled in pumpkin pie spiced sugar….yum. Need to get my hands on pumpkin waffles!! I love pumpkin chocolate chip cookies from my Peanuts recipe book from the ’80’s. Love this post! I love anything pumpkin spice! In fact I’ve bought quite a few things lately that are pumpkin spice. I love the pumpkin spice almonds you can get in bulk at Winco. Can’t wait to try some of these, that I haven’t tried. The Trader Joe’s Pumpkin Spice Chai Latte mix is delicious. I make mine iced and it’s good without being sicky sweet. My favorite is pumpkin chocolate chip cookies with cream cheese frosting. I almost bought the pumpkin spice Cheerios, then I hesitated and put them back. I will definitely try them now! Thanks for doing all the dirty work for us! I am a fan of the pumpkin ice cream as well. I would love to try the Talenti version! That TJ’s pumpkin Daniah Kringle is so yummy! This is some amazing Pumpkin Spice research! I just bought the Maple French Toast Limited Edition Thomas Bagels from Costco and they are super duper good! I love homemade pumpkin streusel muffins. My kids have devoured the pumpkin spice Cheerios very, very quickly and I obsessively stocked up the pumpkin Chobani flips last fall so I would still have them as long as I could before they got pulled off the shelves. The little frosted pumpkin cookies at TJ’s were yummy, like those Mother’s circus cookies but pumpkin! I have loved pumpkin flavored things since I was a kid, way before it was trendy. My favorite from your list is probably the book chicka pop pumpkin kettle corn, although I definitely want to try some of the ice creams! I love Great Harvest pumpkin bread! And I would love to win all these goodies! I love pumpkin, but I have always been too afraid to try some of these things, especially because I would probably be the only one to eat it at my house!!! I have an awesome recipe for pumpkin bread and my daughter and I love pumpkin oatmeal. I just love all things pumpkin really, I do. I love pumpkin spice cheerios!!! They’re soooo good!! I need to try some of these things! I love the pumpkin cupcake recipe from Deb at Smitten Kitchen. I make them every year! We love the Pumpkin waffles from TJ’s. Last time I was there I bought 4 boxes just incase. Love this post so much. Me and my daughter are always on the hunt for pumpkin/fall foods to try. I love pumpkin everything, but had to stop eating gluten a few months ago. (Stupid thyroid!) I’m so excited to see tons of gluten free options in your pile. Thanks for doing the research for me! I like the pumpkin spice m&ms! So hard to pick a favorite pumpkin spice item, but we just made the pumpkin sheet cake from your blog and it was delicious! Also love pumpkin spice m&m’s and oreos. Fun post, thanks. Debating whether to chuck all my chores in favor of a Tillamook hunt. I tried the pumpkin spice Cerritos and didn’t like them. They made my mouth go numb. I love tj pumpkin spice jo-jos! Love pumpkin pie but haven’t really tried any of these items. Have some on my list now! Great round up, I am a sucker for pumpkin spice. Love pumpkin spice almonds. And love pumpkin ice cream with bits of pumpkin pie. Where did you find the Milky Way Caramel Apple flavor at? I’ve been trying to find them for my hubby but no luck so far! I tried the Pumpkin Spice Life cereal too and it doesn’t really taste like anything but cinnamon. I love the little pumpkin muffins they sell at Sam’s Club. They are so moist and delicious! I love pumpkin milkshakes at Arctic Circle, and the pumpkin smoothies at Jamba Juice! I love Nature’s Path pumpkin waffles. They crisp up nicely in the toaster and the flavor is delish. I love pumpkin white chocolate cookies! Pumpkin chocolate chip cookies are my favorite and homemade is better than I can find to buy! The Pumpkin spice Cheerios were OK.
My favorite pumpkin things to date are pumpkin rolls and your pumpkin chocolate chip bread!!! We recently tried the Cheerios and loved them! Current favorite is Pumpkin Spice Eggnog. Or maybe the canned spray whip cream. OR so many other things, EXCEPT pumpkin pie. It’s a texture thing, not a flavor thing. Pumpkin Spice muffins (homemade) are my fave, oh and Natural Bliss Pumpkin Spice creamer makes a yummy steamer! Can’t wait to try some of the above! Pumpkin ice cream is my favorite! I LOVE Pumpkin Pie Ice Cream and am now on the hunt for the Tillamook Cookie Butter Ice Cream – that looks AMAZING. I also want to try the Noosa yogurt! Love the Pumpkin Spice Oreos and the TJ Jojo’s! Holy goodnesss I love all the pumpkin spice stuff too. Although it sounds like our taste buds are different. I love the pop tarts from Trader Joe’s and their snack bars. Yum! Honestly, my favorite thing is just plain old pumpkin pie! I love the Pumpkin Spice Oreos and my son loves the Pumpkin Milanos. I love pumpkin spiced stuff so much! And this might sound silly, but I have a hard time buying some of the stuff I see at the stores, cause I’m so worried I’ll be dissappointed! So I loved this post! I’m definitely going to venture out and try some of these. I love getting pumpkin spice hot chocolate, and my favorite pumpkin spiced flavored item is the pumpkin pancake mix at Trader Joe’s! Ah I love it!!! They are so fluffy and flavorful! I love the classic pumpkin roll and pumpkin cobbler! I’ll have to check out some of the TJ’s goodies! I really, really, really want to try the Cheerios Pumpkin Spice!!! And I’ve been tempted to pick up every pumpkin-flavored item at Trader Joe’s, so if I win, I would be ecstatic!!! ? Okay, love, love, love pumpkin spice flavor, but I tend to lean toward home cooked goods with it such as pumpkin cookies or pumpkin streusel cake. I’m intrigued by the Pumpkin Spice Cheerios. I’ve been seeing them in the store and was afraid to take the plunge. Now I’m totally going to do it! Also, I know that the pumpkin spice dipped pretzels are good. And both of those wafer cookies are going to be on my next shopping list!!! Thanks for all the great reviewing you sacrificed for us! Love me some of the Ben & Jerry pumpkin cheesecake, but you can’t beat a loaf of homemade pumpkin bread. I want to try these! I’d love to win! And I love pumpkin spice coffee creamer! We LOvE to make pumpkin waffles and slather them in buttermilk syrup, maple syrup and/or chocolate chips. We’ve already made these twice this month! Yep. Waffles are a favorite here. Loved this post!! Such good info. I made your pumpkin cake with brown sugar caramel frosting ???? I think my favorite store bought item I’ve tried has been TJs pumpkin brittle. It’s amazing. I am just getting into the pumpkin spice thing! I loved this post. I love pumpkin spice anything- but especially Chobani. I love love love pumpkin bread! And pumpkin ice cream yum! I love pumpkin strudel Muffins I got one time at sams club. I haven’t seen them since but I continue to keep my eye out for them! I’m a fan of most things pumpkin spice. TJ has an awesome pumpkin butter. I put it on Greek yogurt and top it with homemade granola. It’s my breakfast all Fall! I’m a sucker for the pumpkin spice Oreos! TJ’s pumpkin spice cookie butter is pretty amazing. Also love to make homemade pumpkin waffles with your buttermilk syrup recipe. I am feeling a strong urge to run to Trader Joe’s right now! Thanks for this fun post! I had heard about the butterscotch M&M’s being hailed as “butterbeer M&M’s” so we took some on our trip to the Wizarding World in Orlando last week. The kids loved them (not as much as actual butterbeer, but it was extra fun)! I love pumpkin spice lattes. But I’m not terribly picky. Pumpkin spice all the things!!! Pumpkin spice cookies from Target- the ones with cream in the middle and are crunchy! Love the recipe for melt in your mouth pumpkin cookies! Seriously, the best! Our favorite is a throwback to Utah days . Macy’s pumpkin cookies. Luckily we found a great recipe for them. My weakness is pumpkin bread from Kneaders! My kids and I love pumpkin spice bagels with cream cheese! Yummy fall breakfast! These all look so fun! I’m in Canada and usually miss out on all these fabulous finds. Good thing my mom is in the states and will send me a goodie bag every once in awhile. I will be adding some of these to my want list! I have always loved the pumpkin spice pretzels at Costco each year. I have not seen them yet though. I can’t wait to try the Tilamook Pumpkin ice cream. Thanks for the lists! I had some Pumpkin Spice Yogurt Pretzels. Bought them at a bulk store, so don’t know the brand, but they were yummy! Pumpkin cookies… You can’t go wrong with those! Pumpkin chiffon Pie or pUmpkin Spice Latte! So good! My favorite pumpkin recipe is your chocolate chip pumpkin bread. The yogurt. The fluffiness! I die! I love pumpkin spice things! My favorite are these homemade pumpkin spice bagels that I make many times throughout the fall. I got the recipe from a magazine years ago and they are so good! What a fun giveaway! I love making pumpkin chocolate chip bread in the fall…from scratch, not the cake mix kind. Give me all the pumpkin! Especially if it’s gluten free. I’m celiac, but my family isn’t! When I lived in Florida, one of the grocery stores there, Publix, had a really yummy store brand pumpkin pie ice cream that I would watch for every fall! Yumm! Pumpkin ice cream is probably my favorite. Love the shake you have on your site! But I now need to try the yogurt too! Anything pumpkin spice gets tried at our house! I’m a November Birthday, so I like pumpkin pie for my birthday cake. Also my hubby makes an amazing pumpkin spice cake that he found online & tweaked the ingredients, it’s a birthday favorite as well! I can’t wait to see if I can’t find any of your “heck yes” items! I live an hour from any big stores, so I will have to make a list for my next trip! Thanks for your dedication to the best flavor ever! I really like Ben & Jerry’s pumpkin, but let’s be honest, my real favorites are Libby’s pumpkin pie and Starbucks pumpkin spice latte. I am almost always disappointed when I try other products because I’m comparing to the orignals! So far my favorite that I have tried has been the Pumpkin Spice Cheerios but I’m looking forward to the Pumpkin Pie pop tarts hiding in my pantry as well! Oh wow, I never knew that many items existed!! Our family was not thrilled with the Frosted Mini Wheats, but in terms of seasonal items, I love iced coffee and the new International Delights Salted Caramel Mocha coffee is soooooo good! I can’t wait to go buy some of that Ice Cream! My favorite pumpkin spice stuff is the cereal. I liked the instant oatmeal by Quaker and Sprouts. Trader Joe’s has a pumpkin cookie that is coated in yogurt. They’re almost a combination of a cookie and a yogurt covered pretzel. They’re shaped like pumpkins, are orange and white, and have tiny sprinkles on them. You must try them! I ate a whole box single-handedly. Glad you included some gluten-free options in there! Lots of fun – thanks for sharing! Thank you Sara for this awesome post! We love the pumpkin spice Oreos! I LOVE TJ’s pumpkin cranberry pita chips. They are delightful!! I love love love the pumpkin spice Oreos! I just wish they came in a larger package. My 4 year old son and I have been waiting all year for the Thomas Pumpkin Spice Bagels to come back and they finally showed up last week! Oh happy day! We would love to try some other pumpkin snacks and treats! The Trader Joe’s Pumpkin Seed Brittle is the BEST!! I love everything pumpkin! I can’t wait to try these products! I love the new Belvita pumpkin but you also need to try GoGo Squeeze pumpkin flavor (at target) it’s so good! Pumpkin spice bagels toasted with cream cheese and targets pumpkin spice hot chocolate are 2 of my favorites right now. I also have a favorite pumpkin cookie recipe with butterscotch chips that is a favorite all year round! Everything sounds awesome! Love fall and the flavors that come with it! I now have more ideas of what to buy, I am drinking my coffee with pumpkin pie spice creamer and loving it! I love pumpkin frozen custard/ice cream! My husband and I thought the oreos were good. Have you ever tried the market pantry pumpkin cheesecake sandwich cookies from target? Sooooo good! I’m excited to try the boom chicka pop (love their popcorns) and also the trader Joe’s brittle. Both sound yummy!!! My favorite pumpkin spice recipe is for a homemade gluten free (because celiac ??) Pumpkin roll cake from the blog Gluten Free on a Shoestring. So fun. I love homemade pumpkin chocolate chip muffins. We love the Pumpkin Spice Oreos! Okay … I am in total Pumpkin Spice Envy !! I am in Nova Scotia and the ONLY product I have seen from your list is the Lindt chocolate balls. That’s it !! We are virtually a pumpkin spice free zone. Is that fair ?? Not really. 😉 Thanks for the fun trip through the amazing plethora of PS Stuff !!! I love pumpkin spice anything! I love the TJ waffles, too! Pumpkin Noosa has been my breakfast for almost two weeks straight. Just tried the Kringle last week, and it was also delicious! Also love the Petite Pumpkin cookies from Trader Joe’s. I love anything pumpkin! Since my birthday is in October, it’s tradition for me to have pumpkin pie instead of birthday cake. And I love pumpkin creamcheese muffins! I love Target’s Marketplace Pumpkin Cheesecake sandwich cookies, they are delish! This is so awesome! I’m more of a fan of the homemade pumpkin stuff. I have a list of things that I have to make every year. Oh man, my kids LOVE the TJ’/ cereal bars and we made a special trip last week just to get the pumpkin ones. I feel like we need to go back and pick up a few more items you mentioned… like that brittle. Oh, my yum! As most of these are not available in Canada I see a trip to the States in my future! Love pumpkin everything! Eating the mini wheats as I read this. 🙂 I will be adding a few of these to my next shopping list! I was able to find pumpkin spice yogurt in Target’s simply balanced line a few weeks ago and prefer it to the Choboni, but it’s been gone every time I’ve gone back for more. Pretty cool post. Thanks for the info. I like Pumpkin Spice Ice Cream – Tilamook is a great choice! I just had the pumpkin spice Cheerios, pretty good! Going to go grab the Belvita and the Noosa yogurt. I love pumpkin and Fall!??? Chocolate Chip Pumpkin Bread. Your recipe. Love it. Homemade pumpkin waffles with maple syrup, pecans and fresh whipped cream. I think they need to happen tomorrow for breakfast. I love pumpkin chocolate chip bread! woah! so much to try, so little time. I’m afraid fall will be over before I get a chance to taste them all! I fell in love with TJs Pumpkin Ice cream last fall when I was pregnant but didn’t want to be :-). It helped me eat my feelings. Now with baby in my arms, I’ll eat it to celebrate! I forgot how much I loved it! I love pumpkin ice cream, my favorite is probably Tillamook, but I can’t find that where I live… so I deal with the HEB brand, and it’s delicious! 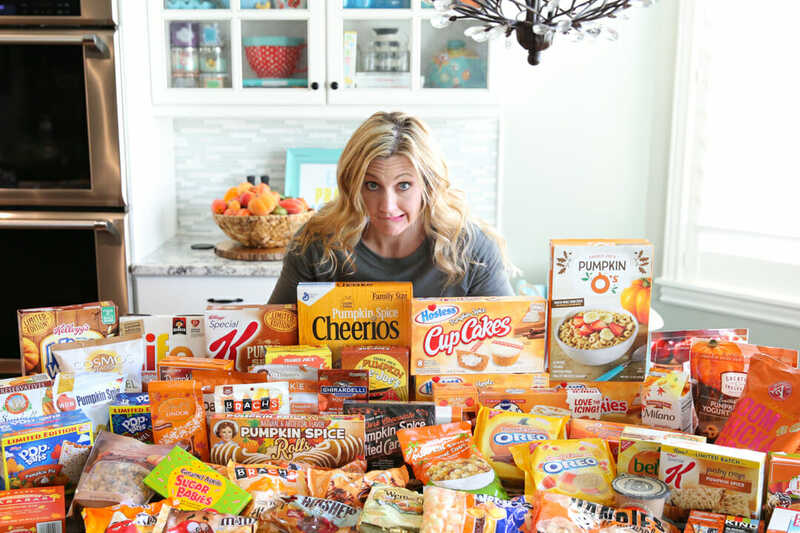 I want to try basically EVERYTHING you posted now, but I’m doing a healthy living challenge with my entire family for the next month, so I may have to buy a few and stick them in the pantry for next month! Pumpkin spiced donuts and pumpkin chocolate chip cookies. I’m a baked goods fan for sure! Looks like I need to go to the store! Has anyone tried the TJ pumpkin cheesecake? We LOVED the pumpkin spice Cheerios so much!! A match made in heaven! I’m on the Whole30 right now, so the Pumpkin Pie Larabar is my BFF. Costco had bags of pumpkin pie almonds this weekend – and they’ve had them in years past. They’re not a Kirkland brand, light colored bag by the candy/fruit/nuts. (I’m super helpful, right? This is why you’re the lady with the blog – not me! lol) Anyway, they’re a huge favorite of my friends. I personally prefer homemade pumpkin chocolate chip muffins or bread to anything at the store. Oh man! How do you pick a favorite??? I love pumpkin pie, pumpkin cookies, pumpkin bread, etc. etc. etc! This week we are going to test out a new recipe….Pumpkin cheesecake snicker doodles!! Oooooooo…..that reminds me!! Olive Garden pumpkin cheesecake?!?!? One of the best cheesecakes I have ever had!!! That’s my favorite right there! Sarah – you have made my day. We LOVE pumpkin everything at our house but nervous to try some stuff. Thanks for making it easier at the grocery store next time. This was an awesome post! I am dying over this post! I totally fall under the “Buy all the Pumpkin!” group. I really like the TJ’s Maple leaf cookies. Can’t wait to try some more stuff! I LOVE Trader Joe’s pumpkin yougurt – it’s much better than Chobani’s pumpkin Greek yogurt…..the Trader Joe’s version tastes like a creamy pumpkin pie….delish! And of course their pumpkin spice Jojo’s are the best! Pumpkin pancakes are a favorite at my house this time of year. Also, I made pumpkin spice rice pudding this weekend and it was GOOD! I love pumpkin….my favorite is a pumpkin bagel with pumpkin cream cheese!!! I had those caramel apple pretzels. They were so amazing. I thought I bought them at Target. I was either mistaken, or they were out of stock when I went back for more. I’m disappointed that you didn’t enjoy the Frosted Mini Wheat’s more. They’re my favorite! Good thing I’m stuck at my desk all day or I’d be out buying ALL the new things I just learned about! I was disappointed in the Quaker oatmeal, personally. Our grocery store carries the signature select brand…I might have to stop on my way home tonight and check for that ice cream! My favorite fall thing are the Pumpkin Spice ghirardelli squares. I loved seeing this. I would have never tried the Noosa pumpkin yogurt and now I can’t wait to try it! Love pumpkin pancakes with a cinnamon maple syrup. Also love adding some pumpkin spice seasoning to my latte each morning. This made me laugh so hard. My girl friends and i do the same thing! Have to share the love! My favorite pumpkin spice snack is Trader Joe’s pumpkin spiced pumpkin seeds! Pumpkin cupcakes with cinnamon cream cheese frosting are also a favorite of mine. I’ve made 4 batches this fall already! Oh my goodness this post definitely speaks to me! I love me some pumpkin spice! My husband thinks I’m crazy that I buy anything i see that’s pumpkin flavored. I love pumpkin bread! Thanks! Albertsons pumpkin pie ice cream, it totally taste like a slice of pumpkin pie with ice cream on the side. I love pumpkin ice cream from cold stone mixed with chocolate, no mix ins. Yum! You need to try a pumpkin bagel with pumpkin cream cheese from Einstein Bagels. I wait for them every year! We really like the Godiva pumpkin spice truffle but their pumpkin cheesecake truffle isn’t that great. I’ve always been a huge fan of pumpkin spice. My favorite is definitely pumpkin roll. Einstein bagels – cinnamon sugar bagel with pumpkin cream cheese! And Mel’s Pumpkin Cookies! I agree with you- TJ’s pumpkin seed brittle is AMAZING!! Definitely a fall fav! Thank you for doing this! I always wondering how the specialty items taste. Looking forward to trying some Heck Yes!!! I’ve never seen the caramel apple Cosmos but the pumpkin spice version is incredible!! Yes! I couldn’t find the pumpkin spice one anywhere! The ones from Costco?? LOVE them! My store doesn’t have them yet- I keep looking! Love the Trader Joe’s pumpkin bread mix! Definitely one of the best! I bring home all the pumpkin spice goodness! I’m the only one in the house who eats them yay more for me! My fav pumpkin anything is Martha Stewart’s pumpkin cookies with browned butter icing. They are insane! I also love savory pumpkin flavors- soups, pastas, etc! My kids love the limited edition pumpkin muffins from Costco. I buy dozens and freeze them. They are perfect after one minute in the microwave. Mmmmm, I love Fall! I haven’t seen these yet! I love Trader Joes pumpkin spice oatmeal! It’s the best! I just made chewy pumpkin chocolate chip cookies that are amazing!! I love pumpkin spice pancakes! I have been wondering about the Belvita cookies (love them!) and so I’m glad you tried them, now I need to go get some! I wish they had them in the bite size, love those ones to throw in my bag to go and share with my 3 year old while we are out. I can’t wait to try the Ice Cream…I need to head to Alberstons ASAP! I love almost all things pumpkin! Tillamook pumpkin ice cream is the best. Thanks for the reviews! I love to make pumpkin rolls. This year I tried the pecan pie m&ms, not very good:(. Homemade pumpkin bars with cream cheese frosting are my favorite fall treat. We tried the pumpkin spice yogurt pretzels from Costco and they were very good !! First off, I think I need to move to Boise! I don’t think we have nearly as many delicious pumpkin spice things here. I already tried to track down that Tillamook ice cream and they say no stores within 140 miles of me are carrying it. ? I’m a HUGE fan of all things pumpkin and it’s hard to pick just one…but Trader Joe’s Pumpkin Pie Spice Cookie Butter is definitely high on my list. Yum. TJ’s Pumpkin Waffle is pretty good – like to mix it in with the regular pancake mix. Kids love it! Costco also has a Pumpkin Caramel thin cookie – pretty tasty! TJ’s pumpkin cheesecake is really good too:) Love most ANYthing pumpkin!!! I love Nuccina Pumpkin Spice Cookie Butter I found at Big Lots. And the Pumpkin Spice sunflower seeds @ trader joes. This is amazing! I love this post so much! My favorite recipe is actually one of yours. It’s the easy pumpkin chocolate chip muffins. My daughter requests those every year for her birthday! She doesn’t even want cake, only your muffins! My favorite pumpkin thing is pumpkin whoopie pies. But my favorite fall treat is the caramel apple sugar babies! So good! And now I have to make a special trip to Trader Joe’s! Thanks for doing all the research. I love pumpkin spice everything-doughnuts, bars, teas, breads, etc. Can’t wait to try the TJ Joe Joes. I love Pumpkin pie from costco, but I’ve got to try that’s tillamook ice cream and those Oreos. I love the Milano pumpkin spice cookies! Pumpkin Cheescake from the Cheesecake Factory!! I honestly wait for fall when this comes on their menu! I love this idea. Love seeing Racine Kringle is shipping further away – it’s a big SE Wisconsin item :). I haven’t ever really tried pumpkin spice anything, but I’m so intrigued by this I may have to dive in and try some things! I love all things pumpkin though, does that count? I will eat pumpkin spice all the things. Putting pumpkin puree and spice in my oatmeal is a fave, and once I had a Pumpkin Spice Chai Latte that gave me life. Yay, pumpkin!! I LOVEEEE pumpkin spice oreos, but I’m heading to the store to try that Tillamook icecream now! I’ll try anything pumpkin spice!!! I seriously LOVE this post! My favorite is to make pumpkin spice white hot chocolate. Mmmmmm….? I love the bark things and just pick up a bag from Costco! I’m excited to try some of your ice cream recommendations. Wow! I can’t believe you tried all of those things. Personally my family LOVES the TJ’s Pumpkin Rolls. My sister tried the Lindor Truffles but did not like them, I have not tried them yet but they are in my pantry, We Love the Autumn ice cream from Schwans. It is to die for. The little Pumpkin Spice cookies at TJ’s are like the Mother’s Circus Animal cookies, so good. Thank you for doing all this research for us and saving us all time and money. Honestly, I don’t know if I’ve tried storebought pumpkin spice treats! I love love love pumpkin pie, though! So it looks like I should branch out to the storebought goodies! I love pumpkin spice too!! I love pumpkin cinnamon rolls and traditional pumpkin pie. I’ve loved making pumpkin overnight oats too. Pumpkin spice muddy buddies! Oh and pumpkin spice cocoa. ? I’m here for ya, haha! Wow! Seems like quite the undertaking! Glad I have you to do this for me because I’m always afraid to spend money on something that I might not like. I have to say that I’m really looking forward to trying the pumpkin spice Cheerios. My favorite pumpkin flavored thing EVER is your recipe in your Savoring the Seasons cookbook. I can’t think of the name but it’s a yummy pumpkin and cake concoction that I crave every year. The pumpkin waffles from Trader Joes are a new favorite! I went to TJs and got a few of the pumpkin things but the BEST thing I tried (but didn’t buy) was the pumpkin bread pudding they had a sample of! I little let out a little moan when I took a bite and the sample guy giggled. HA! I think I’ll grab a box for the “lil pumpkin” baby shower I am throwing in November! thanks for all the recommendations! Oh, yes- love the Krispy Cream ones! Pumpkin spice everything!! But pumpkin spice Oreos are one of my all time favorites! This post was made for me! Love me some pumpkin! I’ve been looking for the Tilamook ice cream! Where did you find it? Got it from Fred Meyer (Which is a Kroger store)! King Arthur flour has this amazing gluten free pumpkin spice cake with cream cheese frosting that I could eat all day…and night…and weekend…and never ever ever ever get tired of. I make it ALL autumn long. It’s the best thing ever. Seriously. Go get it and eat it. I’m a pumpkin spice addict like you. So is my best friend. Which means that we buy and bake and make and share a LOT of pumpkin stuff this time of year. Last week she made us fried Oreos (Double Stuf) using a pumpkin spice batter. They were amazing! The Belvita bats were surprisingly good! I’m a massive pumpkin fan, I love pumpkin chocolate chip cookies, pumpkin cinnamon rolls with cream cheese frosting, pumpkin shakes… The Tillamook ice cream sounds divine! I LOVE the Noosa yogurt, love Pumpkin flavors. This is amazing!! I need to try that pumpkin spice popcorn! You are amazing! I love that you did this. To be honest, although I love pumpkin spice, I haven’t bought one single thing you showed here. I love Starbucks Pumpkin Spice lattes. 🙂 I know, not listed. I really should try some of the things but I love that now I have your list so I know where to start!! I love anything pumpkin flavored! This makes me even more excited to try these pumpkin things! I tried the Quaker pumpkin oatmeal and it’s really good! Haha, I’m the same way! I love Starbucks caramel apple cider, pumpkin muffins from Costco, pumpkin spice bagels from Einstein, pumpkin spice cream cheese, oh the list could go on ???? Loved this post! I do love ANYTHING caramel apple flavored, especially the milky ways! My favorite pumpkin spice dessert is a recipe I got from my sister. We call it pumpkin bars. It’s thick and delicious and has an amazing pumpkin spice cream cheese frosting on it. Definitely my favorite. I try not to make it thought because once I start I can’t stop eating it. I love homemade pumpkin bread. I’m really tempted to run to Trader Joes and pick up several of the items on your list! I need to try all the good ones. Love love pumpkin spice and look forward to it every year!????? I have been trying this with my husband! He says I have fallen into the pumpkin spice trap, since the ones we have tried haven’t been all that good… but I do love TJ’s pumpkin spice cookie butter! Those creative snack Co pumpkin pretzels are my serious vice. I could eat the whole bag in 1 sitting!! Soooooo good! The pumpkin spice pretzels and the caramels tie for my favorite! But really, any product with pumpkin spice in the name will do. Nice work! I’m always afraid to spend money on seasonal things in case I don’t like them. Also my husband hates pumpkin! It’s the worst! Nice to know which ones are worth it. I love pumpkin flavored things, but classic pumpkin pie is still my favorite thing. I have an October birthday and always get a pumpkin pie instead of a cake. My husband does not appreciate my tradition. I love pumpkin anything but my favorite is the pumpkin pie blizzard from Dairy Queen! Oh my gosh, me too! I need to add that! Looks delish — thanks for trying these out! Love those Trader Joe’s pumpkin cookies! I love TJs pumpkin pancake and waffle mix! With Apple butter on top- it’s amazing. I love pumpkin sheet cake with cream cheese frosting. I’ve always been afraid to try ready made pumpkin flavored things but I guess I need to! I absolutely love Little Debbie Pumpkin Delights. I look for them every year and buy several boxes! The pumpkin bread with streusel topping that Sam’s had for samples last week was delicious. Oh. My. Goodness!!! There is no way I could pick a favorite pumpkin treat! I love it all. I’m making some pumpkin butter today. Yum! I love making my pumpkin pie a little healthier by adding egg beaters instead of whole eggs and non fat evaporated milk. Then I don’t feel so bad about eating the whole pie!! Trader Joe’s mini pumpkin pies (they are in the frozen section) are a HECK yes. Had them at book club and didn’t discuss the book, I was too busy eating these and the maple cookies you already mentioned. Also, Trader Joe’s pumpkin spice tea is awesome, no caffeine, hints of apple and cinnamon and heaven. Someone was just telling me about those mini pies, I need to try them! What a fun post! I love stuff like this. I love Pumpkin/Fall flavors. A few of my favorites are caramel apple suckers, pumpkin spice m&ms, I love any kind of pumpkin sweet bread, soft pumpkin cookies with chocolate chips…to.die.for! One of my favorite things that I indulge in is a Starbucks hot chocolate with pumpkin spice or a caramel apple cider. So, yummy!! It’s not always easy on the budget or waistline so I usually only get a few a season and I savor every last drop and I never share! haha!! My favorite are classic pumpkin rolls with cream cheese frosting! Thanks for doing all the work so I can go out and buy pumpkin flavored everything! I love everything pumpkin spice too! I just recently tried making your pumpkin spice cinnamon roll recipe and oh my goodness! Delicious! I heart pumpkin spice, too! Trader Joe’s Pumpkin Bread mix is the best (second, of course, to your recipe )! And pumpkin ice cream (can’t remember the brand I tried). …Yes, way (that I suggested it to them AND a bit of a sore loser 🙂 ) AND I can’t believe MnMs (or Hershey Kisses) hasn’t made the all-time, best choco combo for their products. I am writing to them to suggest it..it is not pumpkin or spice. It is an everyday staple in homes all over the world…can you guess it?? Now you have to tell me! I was going to say Peanut Butter, but M&M’s already does that one. What is it?! I love the Pepperidge Farms Pumpkin Spice Milano Cookies! The pumpkin spice almonds are also really good 🙂 I would really love to try all of the pumpkin spice things though, I’m a huge fan as well! Pumpkin trifle is my favorite! Though I don’t think I’ve met anything pumpkin I didn’t like. Oh, and the pumpkin scones from Starbucks….yum! Pumpkin Spice Lattes (of course!). A local bagel shop had an amazing pumpkin bagel with a cinnamon spice cream cheese – so good! Those pumpkin spice cheerios have been my favorite new thing this year. And I need to get my hands on all of those ice cream flavors STAT! YES! My store doesn’t have them yet and I’ve been looking! Sad! My sister is from Boise and is coming down next weekend…I could always send back a bag (or 3…) with her if you get a hankering! Anything and everything pumpkin is my favorite. It’s hard to pick just one! I love pumpkin spice, especially pretty much any coffee variety! Those Pumpkin Seed Bark Thins are awesome! Costco has carried them in past years… both a good thing (big bag) and a bad thing (big bag = dangerous). Love this list! And I’m on my way to Trader Joe’s right now! Pumpkin cookies and pumpkin spice pancakes are our favorites this time of year. This is a great list, thank you! I love pumpkin spice sheet cake but I just tried the Special K pumpkin spice cereal and thought it was pretty good. I agree with you though–it needs more of those little balls of goodness in it. I should add that I LOVE TJ’s Pumpkin Pancake Mix… I seriously buy enough boxes to keep in my freezer to last for an entire year. So, so good! My favorite pumpkin spice thing so far is Extra Pumpkin Spice Gum! Have you tried that one. It’s hard to find and goes quickly in my store. Pumpkin bread and cake are my favorites! Pumpkin spice is my weakness! Thanks for all the research ? I love Entemanns pumpkin doughnuts and Archer Farms pumpkin spice hot cocoa. I am very picky about pumpkin flavored stuff but I love cost is pumpkin streusel muffins! This was such a fun post! I’ve always wanted to try all of the different holiday/special edition flavors, but I” always too scared! Haha. Thanks for doing it for me! Two of my favorite pumpkin spice items are Thomas’ pumpkin spice bagels. You had the english muffins, but not the bagels. SO good! Also, Sconza pumpkin pie almonds. Yum! I’ve been eating Pumpkin spice Cheerios several times a week. I’d like to try some pumpkin waffles. I bought my kids the Pumpkin Life but they didn’t think it was much different from regular Life cereal. I have to say I Love the pumpkin donuts from Dunkin’ Donuts. I recently bought the pumpkin spice cheerios but I haven’t opened them yet. I’m glad you love them so I most likely will too ? Trader Joe’s Pumpkin Cookie Butter! So delish! Oh my goodness!! This is so fun!! Not a food, but I bought pumpkin spice Chapstick this year that and I can’t stop wearing it! I love the trader joes pumpkin ice cream, but I can wait to try that tillamook!!!! I love pumpkin spice so much I’m trying not to go out and buy everything you said heck yes to right this second. I wish I lived near to a Trader Joe’s, but I’m definitely going to get some ice cream and Cheerios tonight. Love pumpkin spice Oreos! I am not a big fan of pumpkin stuff, but would be interested in trying some. I love pumpkin bread! But pumpkin spice almonds are are delicious too!! I’m a fan of the classic pumpkin cookie. Looks like I’ve been missing out. We love the TJ’s Pumpkin O’s. TJ’s isn’t close to us but my husband made a special trip. Now I need to find the Cheerio’s if they’re so much better. Aldi’s pumpkin spice cream cheese spread is delicious! YES! I just bought more today! I love making pumpkin pancakes. I made your pumpkin cake last week and it was so good. The best part is that there was plenty to give to neighbors! I’m hopping in the car now and I’m running to Trader Joe’s I’ve got to try all these yummy fall flavors! Pumpkin cake roll! I only get it at Thanksgiving. Golly it’s good. I also really love pumpkin roll pancakes. I collect neighborhood Jacko lanterns after Halloween and make puree. It makes me feel so domestic. I need to try the TJs salted caramels and the pumpkin spice oreos! Yum! This will save me so much time at the store. Thanks! The best thing about fall Thomas brand pumpkin spice bagels. Toasted with butter and honey, oh my goodness! I already ate two bags myself since they came out. Starbucks’ PSL and homemade pumpkin cheesecake! I loved the pumpkin Oreo’s. I need to get some of the Trader Joe waffles. I’ve been wanting pumpkin pancakes or waffles for the past week. Need to give them a try now. Any pumpkin ice cream! I’m excited to try lots of items on your list! I like pumpkin spice coffee creamer! That Noosa yogurt is amazing but I can’t eat yogurt without digestive repercussions. Been wondering about those Belvitas- thanks for the review! This is awesome! I made Mel’s from Mel’s Kitchen Cafe’s Chocolate chip pumpkin cookies last week and they’re to die for! I love using the Pumpkin Spice Oreos to make truffles dipped in Wilton Pumpkin Spice Candy Melts! I LOVE all things Pumpkin Spice, especially that famous latte. However, my favorite thing is something from TJ that you didn’t try (because it’s a beverage) — the Pumpkin Rooibos tea. It is comforting and tasty, and just reminds me of home! Thanks for the chance to win. I almost bought a box of pumpkin spice cheerios this morning, but #impusebuy so I didn’t. Now I’m really regretting that decision! I had a pumpkin pie blizzard this morning at 10:30. That’s not too early is it? I love all things pumpkin spice! You need to try the Thomas bagels! What a cool review and giveaway. I wish you had added coffee creamers because Bailey’s Season Favorites Pumpkin Spice is YUCKO ! Trader Joe’s can almost never go wrong, their pumpkin yogurt is a hit every fall. And I’m so excited to try more of this goodness before it’s all gone! I really love those maple leaf cookies from Tj’s, but am now on the hunt for the pumpkin nosa yogurt. That looks amazing! I loved the trader joes pumpkin pancake mix and the pumpkin joe-jose! We like Schwans pumpkin spice praline ice cream. I also thought the pumpkin spice Life cereal missed the flavor mark. It was pretty bland. ?? Thanks for doing this. Also, now I know how much pumpkin stuff is out there! I just love that you did this! Pumpkin lover for life! I love DQ’s pumpkin pie blizzard, the pumpkin joe joes and Noosa! Now i need to take a trip to the store!!! I want all of these things! I love pumpkin pie blizzards! Grabbing one tonight before the diet bet starts. I love the original pumpkin spice product–PSL from Starbucks. I do also really like the new Belvita PS biscuits. Love pumpkin! I have a major weakness for pumpkin pie blizzards. Those pumpkin spice cheerios got me through morning sickness and first tri, so apparently I am growing a baby pumpkin lover too. Pumpkin spice kisses topped on a warm snicker doodle cookie is heavenly! I love pumpkin (pumpkin bread, pumpkin cookies, etc. ), but I’m afraid to try all the pumpkin flavored goods for fear that they’ll be fake tasting and disappoint me. Thanks for the reviews! Off to try several! I love trader joes pumpkin soup crackers and the pumpkin cheerios! I love every thing Pumpkin… but what has been my go to is pumpkin butter!!!! OMG I even put it on my pulled pork! so good. I love pumpkin spice everything! McDonalds Pumpkin Spice Lattes are my latest weakness! What a fun, festive blog post and giveaway! We love, love, love the Pillsbury Pumpkin Cinnamon Rolls. However, we don’t love the frosting that comes with them. Make cream cheese icing for the rolls, they won’t last long! This is hilarious! My husband and I went and tried a bunch of TJ’s pumpkin stuff last week too. I love the pumpkin Oreos and I love homemade pumpkin chocolate chip cookies too! My fave pumpkin spice treat at the moment are your Pumpkin Spice Cinnamon Rolls with Maple Glaze, though I add some toasted pecans because we love the added chunks and crunch at our house! Though I am excited about the pumpkin spice Joe Joe’s (have yet to find a better flavor than the peppermint but I’m optimistic about pumpkin) and Boom Chicka Pop! I love the Pumpkin Spice Milanos! They’re a great marriage of our traditional and forever loved classic with a pumpkin spice twist. I can’t wait to try the Talenti Gelato though!! Pumpkin icecream is definitely my favorite Punkin flavored thing! Yum! I know want to go try a bunch of these. I love the TJ pumpkin JoeJoe’s. I have a recipe for pumpkin scones(the English type) that I love! I’m so glad I saw this on FB! I bought the Special K cereal and had it Saturday. I agree with you need more the of yogurt balls but good. Now I will try the cherrios!! I’m going to have to try the icecreams. DQ Blizzard is prob my favorite!! My favorite is a pumpkin pie shake! But I’m thinking I need to try some of these items! I love all things pumpkin spice! I have a recipe that I got long ago from channel 5 in Utah…..Pumpkin Crunch muffins. YUM! They are probably my favorite pumpkin thing. Wasn’t crazy about pumpkin Cheerios. I do like there candy corn Oreos though. Love me pumpkin everything! I love the pumpkin blizzard and love your recipe for it! LOVE pumpkin chocolate chip bread. I love TJs pumpkin bagels and cream cheese but haven’t gotten them this year. I’ve kind of avoided TJs because I know I’ll want everything! I loved the frosted mini wheats last year, I’ll have to try the cheerios this year! Pumpkin Spice Cheerios! I eat them with protein milk in the mornings, stick my hand in the box in the afternoon, sprinkle them on yogurt or ice cream in the evenings. So good! Love this list! My fave pumpkin spice are the salted caramels from trader Joe’s. This is awesome! Some of the things I’ve always wanted to try, you have covered. I love the TJ pumpkin spice cookie butter. SO YUMMY! I tried the Pumpkin Spice Oreos a few weeks ago, and loved them! My favorite pumpkin spiced things: pumpkin cranberry muffins (like with real cranberries not craisins), pumpkin pie, and those pumpkin cream cheese roll things that I really want to make but have never actually attempted. I must say that I almost bought the pumpkin spice wafers but grabbed the apple crisp ones instead. And the tillamook ice cream has me really intrigued so I will be looking for a splurge on that on my next grocery trip for sure. With so many comments, I’m worried my favorite, best, most beloved pumpkin spice recommendation will be buried! I’m sorry you didn’t love the Thomas pumpkin spice English muffins, but don’t give up on Thomas yet!!! TRY THEIR BAGELS!! There is NO better breakfast (or lunch) (or dinner) (or snack, basically any time food, okay?) than a Thomas pumpkin spice bagel, TOASTED, with real butter spread on top. Eat the bottom half first, then the top. I’m only being this bossy because of my years of experience buying and enjoying these celestial creations. For real, I am currently drooling, and looking for my keys so I can go buy some right now. You won’t regret these! Totally the pumpkin spice almonds from Costco! Pumpkin coffee creamer in hot chocolate is amazing!! One of my favorite fall treats! I’m surprised you didn’t buy and test out the pumpkin loaf mix from TJ’s. That is my all time favorite. I buy them by the case and use them all year round. Pumpkin chocolate chip muffins are my favorite. Okay. Not strictly pumpkin spice, but the pumpkin pasta sauce at Trader Joe’s is amazing. So so good, and so much fun on their pumpkin shaped noodles. What a great post!!! This stuff looks amazing! Oh, I love Pumpkin Spice! We’ve tried the cheerios and the frosted mini wheats. Our current favorite is a pumpkin granola at Costco. It’s not really pumpkin spice, but pumpkin seeds and cinnamon-y. My boys are addicted, which I find very funny to see a 7 and 9 year old fighting over who gets to eat the organic, gluten free pumpkin granola. Better than the cheetos! Love, love, love Ben and Jerry’s pumpkin cheesecake ice cream!!! Pumpkin chocolate chip bread!!! I need to try pumpkin flavored ice cream!!! Yum!!! Pumpkin chocolate chip cookies are my favorite but pumpkin spice almonds are yummy too. Our local Winco has pumpkin spice almonds in the bulk section that look & taste exactly like the Costco ones (we did a taste test last year). After reading your blog I really want to try the Tillamook pumpkin ice cream :). I tried the chioboni pumpkin spice flip crisp thing today and it was yummy! My favorite pumpkin spice thing is egg nog though! Yum! The trader joes pumpkin waffles…AND their pumpkin cornbread mix! Homemade, fresh pumpkin spice donuts made at our local apple orchard! You missed something that I saw yesterday at the grocery store and I thought it sounded awful. There were pumpkin spice Triscuits. I’m very traditional and I like pumpkin chocolate chip cookies. I am very interested in trying some of the cereal mentioned here though! I love pumpkin stuff and get so excited when I see it coming to the stores. I make pumpkin chocolate chip muffins year round and I love buying Costco’s huge pumpkin muffins! Target has these pumpkin cookies that are crispy with a cream cheese filling (and a gingerbread version too) They are the target brand and absolutely delicious! This is not pumpkin spice, but I love gingerbread flickered things right now in the fall. I love Annie’s ginger thins. I don’t know why, but I love them with hot chocolate!! Love me some pumpkin chocolate chip cookies and TJ pumpkin pancake mix. I love pumpkin flavored custard. The popcorn and snacks sound delicious too…. Love the pumpkin spice cheerios! So excited to try the other recommendations. I really enjoy pumpkin ice cream and all baked goods with pumpkin spice. I would love to try the pumpkin joe-joe’s or the Bark Thins! Thanks so much! Loved this and love pumpkin spice! If you can find them, definitely try the Nutragrain pumpkin spice bars! YUM!!! I love the Trader Joe’s pumpkin biscotti. It’s the perfect size and just enough spice…LOVE IT!!!! I actually really like the eggo pumpkin waffles. But can’t wait to try the wafer cookies. Wow! Loved this post! I so wish I had a Trader Joe’s close to my house! I NEEEEED some of that pumpkin seed brittle! What a great list! Many I LOVE and lots I have to try! Thanks! My favorite pumpkin spice things are pumpkin muffins I’ve been making for over twenty-five years. Everyone in my extended family loves them! Second to that are your pumpkin scones with maple glaze – because if dairy allergies in our family, I substitute Almond Milk and Earth Balance buttery spread and they’re beloved by my grandchildren! So many of these I have tried and loved and I found myself nodding throughout the post. But there are still so many you posted about that I haven’t tried and want to. That TJ brittle is so so good and so are the pumpkin chocolate covered almonds you have posted. I have never had the Brach’s brand, so I can’t vouch for that one in particular, but the ones they have at Winco and Costco are amazing! I love your pumpkin pie milkshake recipe! And chocolate chip pumpkin bread! Honestly I haven’t tried many of these but I just love anything pumpkin! I love pumpkin bars. You know the ones with the cream cheese frosting? YUM! I now will have to try the Tillamook Pumpkin ice cream…and ALL the other things you posted! I wish I could do something like this, how fun to try them all! I LOVE the Caramel Apple Sugar Babies, have been eating them for probably 10 years! Try them in oatmeal cookies, sounds odd but they are super good! So many options!! I have a huge list of things to look for at the store now! So glad you did this! I’m always dreaming of trying all this stuff!!! My favorite are my homemade pumpkin muffins! But I always want to try these!! I love all things pumpkin spice but I love my homemade pumpkin pie best! I’m like you–I’ll try anything pumpkin! Right now I’m liking the Special K pumpkin spice cereal but I totally agree that it needs more of the yogurt balls. I can’t even wait to get to Trader Joe’s for O&H kringle (that is where you got it, right??)! We’ve been ordering kringle from Wisconsin for years because it’s the closest to the pastry we love in Denmark. I need to find some of these items. I’ve tried a few already. Chobani greek yogurt flip pumpkin harvest is the best. I can’t get enough of it. Cheerios Pumpkin Spice is very yummy too. Not a big fan of Quaker Oatmeal Pumpkin Spice. I love oatmeal it was a huge disappointment. I’ll try anything pumpkin spice. I love almost anything pumpkin, but especially pumpkin doughnuts, pumpkin bars, pumpkin cake and pumpkin bread! The boom chicka pop fall flabors are SO great! Ha – flavors, I mean. I type better when it isn’t a Monday. Also, my husband bought some caramel apple stuffed Twizzler licorice at Target, which I thought would be disgusting, but was actually pretty good. It reminded me of those caramel apple suckers, but without the propensity to rip out braces with that super sticky caramel! I’m dying!! I live for pumpkin flavored anything. A local soda place has oatmeal cookies with pumpkin frosting (and no raisins!) and I almost cried over the goodness. Did you try the Trader Joe’s pumpkin spiced pumpkin seeds…AMAZING! Oh my word, Sara I was totally laughing through this post! Loved your very technical rating scale. This was SO MUCH fun!! What a great idea!! Thanks for the great post!! Boom Chicka pop is great in the other flavors! I about died when I saw the Pumpkin Spice Cheerios at my local Target a month or so ago. I had to have them and they were A. MAZ. ING. I have a pumpkin cobbler that I make that is to die for. I also have a pumpkin muffin recipe that is great! Pumpkin Ice Cream is wonderful! WOW! I am so impressed at how thorough you were at getting all of these items! I am a HUGE fan of pumpkin spice and try things all of the time, but this review is the BEST ever! Thank you! I love Starbucks pumpkin spice frapacino, along with homemade chocolate chip pumpkin bread. what a fun giveaway! My whole family would enjoy this. My absolute favorite pumpkin item are your Streusel-topped pumpkin chocolate chip muffins! I make them every fall to bring into work and my coworkers rave about them every year! Can’t wait to try these. We love the pumpkin spice mix from Krusteaz. My kids want those pancakes every day in the fall. Pumpkin dump cake! Wow! What an incredible collection! Thanks for trying all those… Definitely need to go try some of those! We don’t get as many fall flavor specialty items here in Canada. 🙁 Hubby loves pumpkin pie (I like it but other flavours are great too) aonhe chose pumpkin fudge once. I them chose my favorite flavours for the other three 1/4 lb blocks. The pumpkin one was by FAR the best and I’ve loved pumpkin things more ever since. That pumpkin Noosa has all my pumpkin spice loving heart this year! I’m not usually a fan of store-bought cookies, but I’m dying to try the Oreos! The pumpkin ones that is. Pass on the candy corn. I’m loving Target’s Archer Farms Pumpkin coffee!! I am most curious about that TJ’s big danish pastry. I ❤️ The TJ pumpkin seed brittle. Mmmm…. I LOVE this!! I love all things pumpkin spice too! I would LOVE this package. I want to try the new trader joes pumpkin spice cookie butter but haven’t yet. I saw your cookie recipe using it! This is amazing! I love Pumpkin Spice coffee creamer but as for food it has to be that Noosa or the Pumpkin Spice popcorn. I haven’t seen it this year thanks for the link. Oh Pumpkin spice cheerios are awesome too. Clearly, I have a problem! I love DQ Pumpkin Blizzards. I look forward to their return each fall. 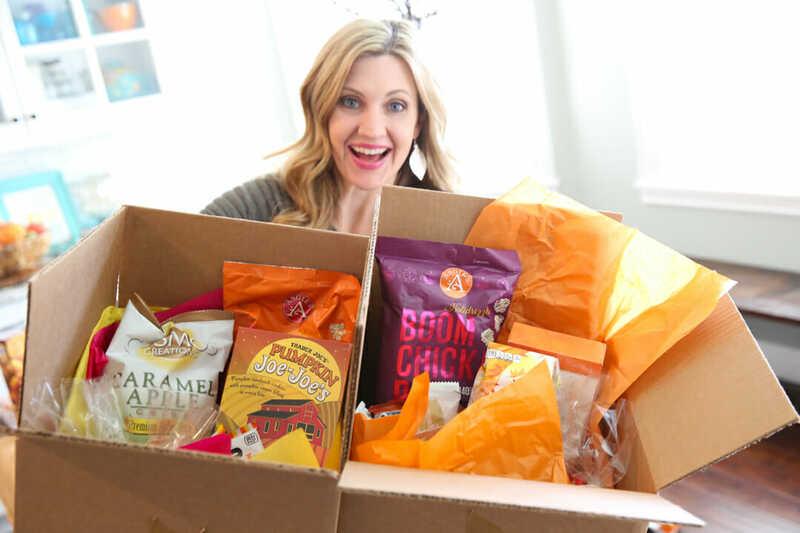 This post made me laugh so much – I LOVE that you did this because I have ALWAYS wanted to take a shopping cart and FILL it with holiday flavors (pumpkin spice being a top fav)! And I LOVE all of the pictures and reviews of everything! One of my favorite of the above listed items is the pumpkin spice yogurt covered pretzels – pretty sure I ate those until I was sick! And I have NEVER seen the seasonal poptarts…please send me a box! Wooooot! I love Costco’s pumpkin pies and the western family brand candy corn. I tried the Life and Cheerio’s pumpkin cereal and like both. I love my mother’s pumpkin bread, hands down best ever! I’m making pumpkin pecan pancakes for dinner tonight with a butter cream sauce over them… I love pumpkin! Love the boom chica pop pumpkin spice! ? This is amazing. I’m literally going to Target today now to find some of these. My daughter and myself love Pumpkin Spice so time to get crazy! LOVE the trader joes maple leaf cookies but am also loving these pumpkin spice almonds in the bulk bins at Winco. It’s gotta be the Ben and Jerry’s Pumpkin Cheesecake Ice Cream! The pumpkin muffin at Cracker Barrel during the Fall is scrumptious! Have them split it in two and grill the portions (like they do their blueberry muffin that comes with one of their salads). The toasted part adds a hint of salty, think salted caramel, and paired with the brown sugar and oats toasted on top & you will want one for breakfast, or dessert, or just whenever EVERY DAY! I know I do! pumpkin spice granola, pumpkin spice syrup, okay, honestly, just about anything pumpkin. I have been eating those pumpkin Cheerios like crazy. But I also tried those pumpkin spice Milanos the other day and loved them! I had no idea how many commercial pumpkin flavors you can buy now. Where have I been? My 21 year old made the yummiest shake, he combined slivers of a Costco pumpkin pie with ice cream in the blender. It was delicious. Being a big ice cream fan, I can’t wait to try the Tillamook flavor. Now, I am really going to have run some hills to get off the extra weight!!! I love homemade pumpkin spice scones with cinnamon icing. Also, Bluebell makes a wonderful pumpkin praline ice cream that my husband and I can’t get enough of! Pumpkin spice ice cream is my favorite! HA HA! This really made me laugh. It is without doubt the most comprehensive pumpkin things post I have ever seen. I really like the TJ’s pumpkin O cereal (having for dinner tonight) and will be on the lookout for the cheerios. PS Eggos! I’d rate these as just ok. TJ’s also has a great PS cream cheese, which gets a heck yes from me. Thanks for doing this! When I had Trader Joe’s Pumpkin Jo-jos I thought I’d died & gone to heaven! Mmmmmm I also love all the pumpkin! We always go crazy at Trader Joe’s- incidentally, I love the pumpkin Jo jos! Another favorite is pumkin spice egg nog. I love autumn! I love lots of things Pumpkin Spice but right now I love muffins! Pumpkin Spice muffins! If they have chocolate chips in them even better! Every year around this time I get a craving for pumpkin spiced oatmeal with pecans and lots of cream. Love, love, love the pumpkin cheerios!!! I love the Hershey kisses! I’ve had the Quaker Pumpkin Spice oatmeal. I liked it, but it’s very similar in taste to the regular Cinnamon & Spice flavor. Excited to hit up Trader Joe’s ? And I think someone commented already but the werthers hard shell-soft center caramel Apple are SO GOOD- way better than the soft ones! So try those next. ? Pumpkin spice bagels! ? My all time favorite is my homemade pumpkin chocolate chip cookies! ?? The TJ’s pumpkin brittle gets my every time. I pretend that I’m getting them for gifts and hoard them instead. Love pumpkin spice oreos!! And homemade pumpkin bread of course! I love all things pumpkin- I also like Pumpkin Puffins Cereal! You can find it at Fred Meyers or Kroger. I love to make a pumpkin custard anytime of year. Similar to pumpkin pie filling, but with less sugar and more eggs. I was happy to see you gve the Cheerios a heck yes. I have been trying to find them at my local Stop & Shop. I am going to have to run to Target so I can try them. I did try the Pop Tarts last year and was very disapointed Thank you for the chance to win such a great give away.. It must have been awesome to try so many things. Looks like I will be making a trip to Trader Joe’s this weekend. I didn’t realize how much yummy pumpkin stuff they have. Publix has the best pumpkin pie ice cream. Can’t wait to try TJ pumpkin brittle. I usually get William Sonoma’s brittle, but it is so expensive. I ate an entire bag of the Boom Chika Pop Pumpkin Spice Kettle corn last night and loved every minute of it! I would love to try the Noosa yogurt! Yummmm!! Pumpkin is the best thing ever! I look forward to it all year long. Favorite pumpkin food is Kabocha (Japanese pumpkin) soup. Favorite pumpkin spice flavor is the Pumpkin Pie Blizzard. Wanting to try Talenti now. Actually want to try the majority of these now! You forgot the fiber one pumpkin bars. I think they are selfish & 90 calories. It’s like eating a white choc chip pumpkin cookie. I have loved the new pumpkin spice Cheerios! I’ve seen recipes to make with them but who wants to have to share them? Holy Cow! I can’t believe how many pumpkin spice items there are out there. I had no clue. I’m a fan of pumpkin bread. Plain, simple, hot out of the oven, or frozen with a scoop of vanilla ice cream. Yum. I hope this isn’t cheating but I love my own baked pumpkin oatmeal that I make big batches of each fall with plenty of pumpkin pie spices. I love your scale! I’ll definitely be trying some of these now. I’m a fan of the pumpkin spice creamer from Starbucks (non coffee version – it’s basically hot pumpkin spice flavored milk mmmm!) the classic pumpkin chocolate chip cookie is always a winner too! I mourn the loss of the original Starbucks pumpkin scone. It was the best. Pumpkin joe-joes all the way! I love Chobani pumpkin yogurt. And pumpkin kisses. I haven’t tried nearly this many things but I want to!! My favorite pumpkin fall item isn’t food though….I love the Bath and Body Works Sweet Cinnamon Pumpkin lotion! So divine. Love pumpkin. My fave from this year (so far) is the Special K Pumpkin Spice cereal. I love classic pumpkin chocolate chip cookies! Have to make plenty of batches during pumpkin season. I tried Peanut Butter & Co’s Pumpkin Spice peanut butter a year ago, but haven’t found it this year. I have also heard the cereal Puffins has an amazing Pumpkin Spice version. One of my favorite pumpkin spice fall things is scones. Brown Eyed Baker (blog) has a recipe for pumpkin scones with spiced glaze that I LOVE. I’m planning to make them this week! I like pumpkin spice stuff in general, but some of your finds stand out. I’ll have to do some hunting around when I’m at the store tomorrow. Homemade pumpkin cream cheese muffins are our fave. The maple cookies you tried are a Canadian standby- we grew up with them. We hardly have any of these products here except the mini wheats which we agree, need more pumpkin. (P.S. If by chance we win, we have a US shipping address 🙂 Fun post! YOUR chocolate chip pumpkin bread!! Every year I make it about 5 times throughout oct and nov and every year I have people asking me for the recipe. ? I totally bought the Quaker oatmeal one to try. It was meh to me. But those cookies I have got to try!! I seriously can’t tell you how excited I am about this list! I’m going to need to print it and keep it in my purse so I remember the best stuff at the store! Up to now, my favorite pumpkin spice recipe has been pumpkin bars with cream cheese frosting, but I’d bet that will be changing after I try a few of these! I love the Trader Joe’s pumpkin caramel corn! I really love the limited edition pumpkin Puffin cereal by Barbaras. It’s usually in the natural food section at Kroger. Pumpkin Greek yogurt! And basically anything homemade. TJ’s pumpkin seed brittle!! And this year I may have “accidentally” bought 4 boxes of PS Cheerios-such a yummy snack! I love pumpkin cake doughnuts!! Ben and Jerry’s pumpkin cheesecake ice cream! Pumpkin bread, waffles, and pie! I don’t eat a lot of candy/treats/snacks. But I love ice cream and pumpkin spiced ice cream is amazing!! mmmmmm. tillamook pumpkin ice cream. I tried the pumpkin spice Cheerios this year and I love them! DQ pumpkin blizzards are amazing and pumpkin pie dump cake is also a fave. i love pumpkin flavored things, especially baked goods. the BYU creamery used to (and maybe still does) make a pretty tasty pumpkin ice cream. i don’t know how it compares to these other ice creams mentioned, but i’m gonna have to try the ones you’ve listed. i wish tillamook was out east! I have been enjoying the Pumpkin Cheerios with my four-year-old! I LOVE pumpkin anything basically. ? YES, YES, YES, HECK YEAH!! to the TJ’s Pumpkin Biscotti!! Just tried it today. It’s SO good with hot chocolate. Delicious. Everything!!! Starbucks pumpkin spice frappuchino is great! Cream based with coconut milk. ??? Great list!! Can’t wait to try some new stuff! My current fav is Thomas Pumpkin Swirl Bread, toasted with butter, yummmm! I cannot believe you were able to do this! What an awesome undertaking. I’m impressed. I love pumpkin spice too! I made a smoothie this morning with it! Yummy! Freddy’s Frozen Custard has a pumpkin pie concrete. It is the best thing I have ever tasted! They put a whole slice of Pumpkin Pie in it and mix it with custard! YUM! I am drooling just thinking about it! pumpkin spice coffee creamer. Maybe you could add in a small section on some diary items… Love your post! Trader Joe’s Pumpkin Chai is amazing !!!! Thank you for doing this!! It’s amazing!! I wish I could find the Talenti here in Minnesota!! I love to get a pumpkin pie blizzard at Dairy Queen every fall. But now we’ve moved, and the closest one to us is 40 minutes away! I really love the Autumnal Harvest pasta sauce from Trader Joe’s . Soooooo good! Homemade wise, pumpkin bread or waffles! I love pumpkin spice cupcakes! Excited to try a few things on your list. I love DQ pumpkin blizzards and the Boom Chicka Pop! I’m tempted to drive 90 minutes to Trader Joes just to pick up a few of these tasty treats! I’ve never had pumpkin flavored ice cream but now I’m dying to try it! I love your pumpkin dump cake and pumpkin pie milkshakes! I love pumpkin chocolate chip bread. My favorite pumpkin item for sure. Oh, and pumpkin ravioli from TJ’s. I love the pumpkin spice Belvita and the boom chicka pop! Pumpkin brownies with cream cheese frosting. Yum. While I have a love/hate relationship with her recipes, Martha Stewart’s pumpkin chocolate chip bars are my favorite! Blue Bell pumpkin ice cream. Mmmm. I love the Trader Joe’s caramel corn! I love making pumpkin cookies with pumpkin spiced Hershey kisses and chocolate chunks. I like Dunkin’ Donuts pumpkin spice munchkins! I don’t know why I prefer it to the whole donut, but I do!!! So my favorite thing about Trader Joe’s is all of this pumpkin spice stuff will turn into peppermint stuff for Christmas!!!! Yay! I love your chocolate chip pumpkin bread but I think my favorite is the Paleo Pumpkin bar recipe from Hummusapien.com. I can’t stop eating it if I make a batch! I love all of the pumpkin stuff at trader Joe’s! Especially the Joe o’s! We bought like 15 boxes last year ? OBB Pumpkin Bread recipe, I make it in mini muffins. Love that you did this post! I have to admit that I prefer homemade pumpkin spice things such as pumpkin quick bread, bars or just straight up pie. But I am going to keep an eye out for some of your heck yes items! Definitely the pumpkin seed brittle! I’m not a huge pumpkin fan but love pumpkin seeds!! I am loving the Teavana Pumpkin Spice Tea! Salted Carmel pumpkin concrete mixer at Culver’s! Heck yes x1000!!! I love pumpkin bars with cream cheese frosting. I made a pan last night and ate 1 or 2 or 3 today. Pumpkin pie blizzards. Hands down favorite! I had the bark thins last year and they were so good! Of course, anything dark chocolate is great in my book! Pumpkin bagels….can’t remember the brand! Pumpkin cookies, pumpkin chocolate chip bread! The pumpkin muffin / muffie at Panera is so yummmm. I forget if they have bagels, though. Pumpkin Spice waffles! This is awesome info!!! Thanks so much. Pumpkin pie blizzards! Pumpkin cookies with cream cheese frosting! Pumpkin spice anything! Love fall! I’m a bit of a pumpkin spice freak every year! I agree, the Belvitas are awesome, but the Trader Joes pumpkin yogurt was awful! You dodged a bullet there! Oh my pumpkin heaven! You don’t know who you’re “talkin'” to! i am the queen of pumpkin spice! I have this built in radar for anything pumpkin spice when I am in a store. I even found pumpkin spice triscuits! What?! That’s right, and they are Heck to the yes!! The pumpkin twinkies frozen…a delightful frosty treat! I am well known by my friends and family for being pumpkin crazed, and on Facebook, I get tagged a bazillion times a day on recipes and jokes about pumpkin spice tampons and toilet paper… we could only be so lucky! My “Pumpkin Obsession”board on Pinterest has more pins than any of my other boards. Yup, it is a problem and I am pretty darn ok with it! My hubby says we need to budget my pumpkin addiction, because it is out of control. So I hope I win one of these to get him off my case for awhile! 😉 You lived my dream trying all of these by the way, someday I hope to shake your hand! 😉 Thanks so much! I love the pumpkin spice Oreos! I agree 100% on Angies Boom Chicka Pop Pumpkin Spice Kettle Corn. I currently have a bag hidden in my car so my kids don’t eat it (somethings I am incapable of sharing). I have also tried the smores flavor, which was just ok to me. Just picked up the Tillamook ice cream. And now I need to add a few more things to my shopping lists. stores each week. I’d love to narrow it down to one or two. I’m a big fan of traditional homemade pumpkin cookies but would love to try some of these treats! I am always excited when the pumpkin spice Thomas bagels come out on the shelves of my local grocery store! You missed the TJs pumpkin spice cookie butter! And their weird cake that’s like a holiday fruitcake kinda sorta. My favorite pumpkin spice recipe is for a no-bake cheesecake. Omg. It’s so good. Homemade pumpkin spice pancakes are amazing! I might even serve them in the summer. That is code for I do but am not ready to admit to it. Have you ever heard of Green Bluff in Washington? Close to Mt. Spokane area. Anyways, there are lots of small family owned farms where you can go to pick your own fruit through all the seasons. They all have great festivals in the fall and most places offer hot pumpkin donuts that are A-mazing! They also sell the most wonderful apple cider. There is nothing better than picking some fresh honey rips apples, getting your carving pumpkins and taking some donisrs home in the fall. THE. BEST. ? My very favorite pumpkin spice food is pumpkin chocolate chip cookies! As a teenager my friend declared it was her favorite cookie, and since then Fall has not arrived until I bake a batch! I love the pumpkin spice streusel muffins from Costco! Love this post and all the great info. Excited to try the pumpkin jo Jo’s and the Mrs. Thinsters cookies! Thanks for sacrificing for all of us and gathering this crucial information ? I’m in Canada so it’s kind of sad for me to read about all the things that are most likely not available here. 🙁 My favourite pumpkin spice flavoured thing is homemade pumpkin chocolate chip muffins. Love love love the Thomas pumpkin spice English muffins! You are amazing! Wow! ?? I love pumpkin spice flavored ice cream! Last fall Costco carried a popcornopolis flavor that was pumpkinish I think and was soo good! I love pumpkin snicker doodles!! In the past Target had a Market Pantry cookie that was pumpkin spice and cheesecake. Like an Oreo but with two pumpkin spice cookie and cheesecake filling. I haven’t seen them yet this year, though that maybe a good thing for my sugar intake! Ok yes! LOVE pumpkin!!! My absolute favorite pumpkins thing is the pumpkin emanada at taco time. It’s seasonal and so delicious!! I have to ask though – after tasting all that stuff, aren’t you a bit pumpkin-spiced-out? You should be careful – what if you ate so much that you couldn’t stand to look at it again?? I love making chocolate pumpkin muffins with a cake mix and can of pumpkin! My fall indulgence is Starbucks caramel apple cider. Sadly, my hubby doesn’t care for pumpkin anything..but he has nat’l guard drill this weekend and my daughters and I have big plans to make pumpkin muffins and a pumpkin crepe that I’ve been dreaming up! Those pumpkin almonds at Costco are THE BEST. 🙂 Let us know when they show up there , will ya? I like the pumpkin spice almonds I got from my son. He picked them up at Winco. Sara, I love that you did this! I’m sure it was so fun, but this is so helpful! I usually stay away from stuff like this because I don’t think it will be great, now I can’t wait to try some pumpkin spice Cheerios! And the Tillamook! My favorite pumpkin things are definitely fresh baked good- pumpkin cookies, bread, muffins, pumpkin roll, all of it! But now I’m excited to try a few of these packaged items too! Thanks for the awesome info!! One of my favorite things I look forward to every fall is Nature’s Path Organic Pumpkin Flax Granola. I buy it from Costco, it is so good and all of my kids love it too! My favorite pumpkin recipe is your Pumpkin Chocolate Chip Bread!!! I can eat that all year long, not just a fall recipe. 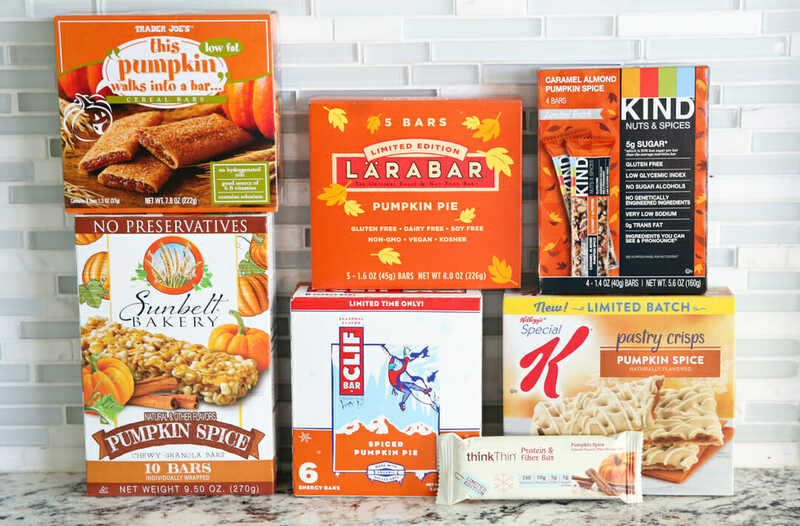 I’m not sure what pumpkin spice thing I like best, but I am intrigued by your post and am going to give some of these a try. Especially the pumpkin popcorn. I hope that your readers who are gluten free will still give the WOW Pumpkin cookies that are wheat/gluten free a try! My son was diagnosed with celiac disease a couple of months ago and we think these are pretty darn good!! Thanks for the reviews… very helpful!! You HAVE to try Nicci Pumpkin Spice Cookie Butter. It’s what dreams are made of. Also Krusteaz pumpkin pecan mix is something I look forward to every year. Pumpkin pie ice cream from The Bent Spoon gelato shop in Princeton, NJ. Haven’t been in 8 years but can’t forget it! Pumpkin cookies are my fav! Wow! We’ll done. That’s a truly thorough list. My favorite is good old fashioned pumpkin pie. I love Trader Joe’s maple cookies. I just love pumpkin chocolate chip cookies this time of year. Saw the pumpkin Life cereal and wondered. Don’t think I’d be brave enough to try popcorn, but after your review I just may! And now I want ice cream. Thanks. I’m a New Englander, so the first commercial Pumpkin item I get each fall is a Dunkin Pumpkin coffee, and then I stock up on CoffeeMate Pumpkin Spice creamer. The rest of the year I drink my coffee totally black, for for 3 months each fall every single cup, brewed or bought, is pumpkin-ed. I love homemade pumpkin bread but store bought pumpkin spice belvitas are a huge hit in our house. Can’t wait to try the pumpkin Cheerios! I love pumpkin snickerdoodles, plus you should pick me because I am 35 weeks pregnant and I clearly need snacks. I’ve heard Ben and Jerry’s pumpkin cheesecake ice cream is amazing, we both should try it! I saw Angie’s favored popcorn at my local grocery store-I love all of her popcorns! Our local orchard has pumpkin spice donuts. Think cider donuts, only with a pumpkin spin. They are…..mmmmm…..deadly. I love ’em! I just had a Pumpkin Spice Greek yogurt from ALDI- it was great! I really like the Hershey Halloween Pumpkin Kisses. They’re hard to find. I’ve got to try the oreos! Thanks for the recommendations. I have a long list to buy if I don’t win! I like just about anything pumpkin spice. I have been waiting to see the Pumpkin Spice Cheerios but haven’t found them. I’ll keep trying. I actually like the pumpkin spice bagels. They aren’t overwhelming. We like pumpkin pie spice in hot milk with some vanilla and sugar. A change from hot chocolate. I love the pumpkin spice Oreos and cheerios! My favorite fall flavor are little Debbie’s pumpkin cookies! So good! Go to the store and buy them RIGHT NOW. I just bought Trader Joe’s Pumpkin Spice granola. Yum! Thanks for sharing ? Pumpkin Noosa….there hasn’t been a Noosa flavor yet that I didn’t like. Dream job!! Though personally I do prefer all the caramel apple flavored things to the pumpkin ? I don’t think I can pick one thing!! I do love the Pumpkin Bagels from Aldi’s though! This is amazing! I love all things pumpkin thanks for the great resource! LOVED this post!! I am always tempted to try everything pumpkin at the holidays-and i’m glad i have your guide now!! Your rating system was fantastic! I love pumpkin flavor but I’m not a fan of pumpkin pie! I had some pumpkin fudge (made locally) that was heaven last week. I do love pumpkin spice Oreos though! I can’t just pick one pumpkin thing. You have lived my dream by trying them all! I will say, though, that I love the pumpkin muffins from the bakery at Sprouts. I buy one every week when I do my grocery shopping there. I get excited when they come around in the fall. Also, yesterday I tried the caramel apple scotchmallow at See’s. You definitely need to give that one a try before they’re gone. I’m looking forward to the pumpkin truffles that show up next month. Yes that Tilliamook ice cream is delish! One of my favorite seasonal items out there! Oh, I forgot to mention, Trader Joes carries those maple leaf cookies all year. I buy them occasionally. They always remind me of when I was in Canada on my mission. They’re all over up there. Oh my goodness. This was amazing. Clearly i’m behind on my game. I love pumpkin spice oreo’s and of course the snacking thins with pumpkin thins. But now I have a gazillion on my list to try! Probably pumpkin spice waffles or pancakes. YUM!! Coldstone Pumpkin cheesecake ice cream, with or without mixins. I can’t choose just one. Probably the DQ blizzard is my very favorite ever, but the thing I discovered this season is the Trader Joe’s Petite Pumpkin Spice Cookies. Boring name – off the charts flavor! In other news, I baypassed that Angie’s popcorn because I saw it in early August when I was still unwilling to let go of summer and I have never seen it since. I am STILL in mourning. Totally gonna order it online!! Oh yum! I love autumn, and one reason is all the yummy flavors and smells that come with it! Pumpking Noosa. I need to be restrained. Seriously. I could eat it all day long. I really want to try like everything but I’m going today to buy the cheerios! They are delicious! What a fun idea! I just might try a few now. I love pumpkin pie spice french macarons that I make with Kate’s recipe for the cream cheese frosting as the filling. So delicious. I was sad you didn’t review the pumpkin pastas etc. I am nervous to try them!!! 1) Umpqua Pumpkin Pie Ala Mode – tastes pretty similar to the Blizzard from DQ. I haven’t found it at my Winco yet this fall, but I’m watching for it every time I go. 2) Pumpkin bagels with pumpkin shmear from Einstein’s. HECK YES! I LOVE the Autumn Mix candy corn. Green apple, caramel apple and apple pie. Mmmmmm! I love fall and it’s my favorite season. I could each pumpkin chocolate chip cookies every day! I LOVE those yogurt-covered pretzels. We’ve been going through bags and bags every week. I’m surprised you didn’t post anything about TJ’s pumpkin cookie butter! I think I need to try some of that ice cream though! We bought the Dairy Queen apple pie and pumpkin pie blizzards and did a taste test with our family. But all the yumminess you have tried so fun! I love the chobani pumpkin yogurt with the toppings to add it, but let’s not forget the pumpkin spiced latte. Can’t top that one! Love TJs pumpkin waffle mix!!! Love pumpkin anything!!! I think my favorite pumpkin spice thing is pumpkin pie or pumpkin cobbler. I’m always pretty skeptical of the store bought varieties. I love homemade pumpkin chocolate chip cookies the most! Dreyers Pumpkin Ice Cream is like a dream in food form! Love! I’ll try just about anything in pumpkin spice! But good ol’ pumpkin pie is in my top favorites! The Salted Caramel Pumpkin Spice custard at Culvers is pretty darn good! I love the Stephen’s Pumpkin spice hot chocolate! It’s so good with the cold stone vanilla ice cream coffee creamer! I went to trader joes this weekend to grocery shop and was amazed at the pumpkin mania in there. It’s a little extreme! But I did buy the pumpkin os (I thought they were just ok), pumpkin cookie butter (heck yes), and pumpkin ravioli, which I haven’t tried yet! This post was so fun. I love the pumpkin ginger ice cream cookies from TJ’s. I’ve noticed more pumpkin spice choices. I’m partial the pumpkin spice latte from Starbucks, and Trader Joe’s pumpkin spice pancakes! I’d love to try more! I love Starbuck’s Carmel Apple Spice, not pumpkin but still way good! WOW! This was intense! I didn’t realize how many products they made that were pumpkin spice flavored. I’d say anything Trader Joe’s makes are golden! I went to a meeting once at a friend’s house and she had archer farms (from target) pumpkin spice nuts (almonds, if I remember correctly). They were SO GOOD! I love the pumpkin spice biscotti from Trader Joe’s! I totally love pumpkin cheerios , and of course I am now going to look for the wafer cookies . Yummy! I love you! This year me and my baby discovered pumpkin cheerios, and love them! The Dannon yogurt is pretty good, tough. Chobani is better, though. I love the Pumpkin Spice Steamer at Kneaders. As long as they don’t scald the milk. That happened once, and it was NASTY!!!! That is my kind of crazy!! I love the Candy Corn Boom Chicka Pop! Dairy Keen in Heber, Utah makes Pumpkin Chocolate chip shakes. Yumm-o! Wow…that is a lot of food! What a fun, crazy experiment! What a fun idea! I recently bought pumpkin spice bagels from a bakery and they are delicious! ? This sounds so fun I’d have a blast doing a taste test like this with our kiddos! Pumpkin Spice K-Cups from Wawa! The pumpkin biscotti from trader joe’s is incredible! I wait all year and buy three when I see them first go on the shelves. I love them! Just the write amount of pumpkin spice. I really don’t know if I’ve tried hardly any of these… But I’m a sucker for pumpkin spice creamer for coffee! Pumpkin spice…. sounds good to me! I love lots of things pumpkin flavored, its hard to choose one!! My fav right now has to be TJ’s Pumpkin yogurt, it is soooo good and so is the caramel apple one!! Thanks!! Hahaha you’re an inspiration. I’m with you though — sometimes they’re SO much better than expected!! And agreed re: pumpkin Noosa, how on earth does something so delicious possibly EXIST?! Love the pumpkin spice latte from Starbucks. They are not usually my favorite coffee place, but their PSL are the best. Wow, you tried a lot of stuff! We have a store here called Lowes Foods and they have all the things pumpkin pie spice, including (but not limited to!) pumpkin ham. My favorite pumpkin spice thing? Pumpkin pie! I just love a good slice of custardy pumpkin pie! Yummmmm. I love pumpkin spice / chocolate chip muffins! Pumpkin spice oreos are something I always have to get a couple of for fall! Also, loved this blog post and definitely saw a couple things that are now on my grocery list! Love all the goodies you found! You should grab some pumpkin donut laffy taffy minis! They are really good!! (they also have Apple Crisp! I need to grab that ice cream from Albertson’s! TJ’s pumpkin waffles are my family’s fave! I loveeeee Oikos pumpkin pie Greek yogurt…and Aldi’s has a really good version when you can find it! I love how many TJs things you tried. I am a bit TJs obsessed. The brittle is amazing!! Pumpkin Pie Milkshake :). I won the employee pumpkin recipe contest last year with these milkshakes. I can’t decide if I’m in awe or terrified. 😛 I really want to try the Noosa pumpkin yogurt – they are my favorite yogurt in general and that you said it tastes like pumpkin pie filling? I’m sold! I love pumpkin spice. One thing not on your list that I love is the TJ’s Pumpkin Spice Cookie Batter. I love everything pumpkin! Have you tried pumpkin spice coffee creamer in your hot cocoa? I tried the Oikos Pumpkin Pie yogurt, it was divine! My husband’s pumpkin bread – pumpkin spice is more than just the cinnamon, cloves, nutmeg, ginger….it is the texture of his bread, it is the smell that consumes the house, it is the taste of course – but it is the whole experience. My pumpkin pie is pretty darned good too…. Pumpkin bread and warm apple cider are my favorite….but my family loves all things pumpkin!!! I love the Pumpkin Jo-jos from Trader Joe’s, and now I want to try their pumpkin danish! i think this is by far my fave post of all you have made…so funny and awesome!! 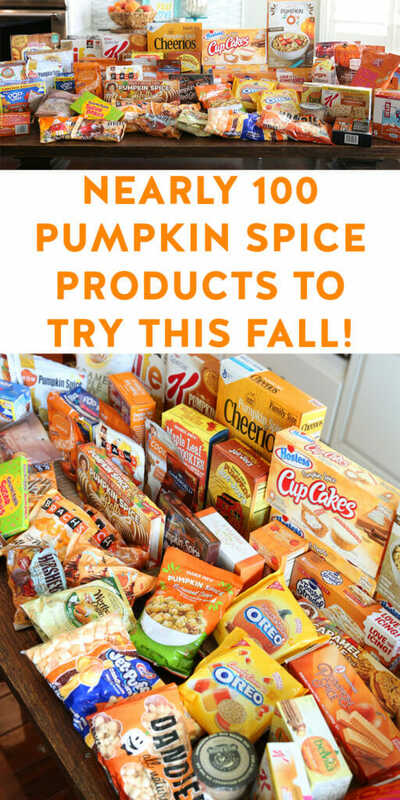 It would be a dream to try it all and I think in the back of anyones mind who love fall and all things pumpkin spice, this would be a dream come true!!! My fave is Natural bliss pumpkin spice creamer, which I know you did not do beverages, but if you havent tried it you gotta! Thanks for this awesome post…love OBB!!! I’m a PSL girl but I need to try more of these! I did get the pumpkin poptarts though. Not bad! We love pumpkin flavored everything around here and I end up making pumpkin muffins every few days around here from mid-september to November! I may be the one who eats the most though! I love the pumpkin almonds from Costco (the winco bulk ones might be the same thing), the TJ’s pumpkin butter and pumpkin ice cream (will try Tillamook next). I love Kind bars, so I’ll be on the lookout for those! Oh yes, I love pumpkin spice,as long as it’s not artificial flavoring. My current favorite is some pumpkin pecan scones I made yesterday. Pumpkin Spice Lattes!! Love pumpkin! Love pumpkin pancakes or waffles or muffins or bread! Would love to try the Cheerios and noosa! I am actually opposite as I didn’t care for the cheerios, but loved the mini wheats! I also love the pumpkin Oreos! I can’t wait to try more of these pumpkin things!! Thanks for all your research ? DQ pumpkin blizzard! And I just made some pumpkin spice oatmeal cookies that were delish! I love chocolate chip pumpkin muffins. I can’t believe you have found all this pumpkin spice products. I knew there was a lot out there, but not this much. Pumpkin Ice Cream – yum! But I really want to know where you got that Kringle!!!!! Did it really come from Trader Joe’s? In Boise? I’m a former Wisconsinite and that is a real Kringle from Racine! One of my kids was begging for some Kringle just days ago. I am so excited now!!! I love the Thomas pumpkin spice bagels! I get so excited when they are finally back in the stores. I try to buy extra to stock my freezer. Goodness I love pumpkin spice anything! My favorite is always the ice cream, I just can’t resist every season! I too just tried the Boom Chicka Pop Pumpkin, it was amazing. Need to try the PS Belvitas! Love pumpkin ice cream but need to try a new brand. Thanks for the recommendations! I like the Tillamook Pumpkin Cookie Butter Ice Cream. Yummy! Pumpkin bars are my delight! We’ve tried the butterscotch M&Ms – my husband LOVED them but I could only eat a few at a time. I really love Caribou Coffee’s white chocolate mocha…. I know it’s not really one of these types of products but I love it. That and Starbucks Pumpkin scone! I was so excited when my local Kneaders started up their Pumpkin Spice steamers again. I made the husband go with me to get one on date night. He wasn’t thrilled, but he indulged me. That PSS gets me every time! I found fall flavors of Entennman’s Donuts the other day. I tried the Pumpkin Spice glazed buttermilk ones and while they didn’t blow me away, they were tasty. But I’m a loyal fan of the regular buttermilk flavor, so it would take a lot to top those. They also had an Apple Cider flavor that I’m definitely going to try next time. I want to find those sugar wafer cookies and the toaster strudel for sure. Wow! What a thorough review! I can’t wait to try some of these and I love knowing which ones to avoid. My son and I love the Eggo pumpkin waffles but now I want to get the Trader Joe’s pumpkin waffles to compare! Thomas’ Limited Edition Pumpkin Spice bagels with a scoop (or 5) of warm butter are delish!!! I’ve tried pumpkin spice ice cream, but never the Albertson’s variety, which I think I will go get. I love pumpkin spice cookies, but couldn’t tell you which brand is my favorite; I’ve never tried the Oreos, perhaps I’ll get some to go with my ice cream. Pumpkin spice donuts are always a treat. I have always wanted to do this! So much fun! Now I need to know the best pumpkin donuts. And apple cider donuts. I tried the pumpkin spice Life cereal and agree with you—it’s pretty good! Pumpkin spice Oreos are my jam, and this would be a dream come true as I’m the people too. The pumpkin pancakes on Annies Eats are my favorite! So fluffy and SO good! I eat them with cinnamon maple syrup. who knew there were so many pumpkin spice/fall flavors! I love it!! I love pumpkin cookies and pumpkin bran muffins! But my very favorite is freshly steamed pumpkin. Mmmmm. I love the Fall! My favorite thing to get is an Arctic Circle (Utah local) pumpkin shake! What a fun post, thank you! You have saved me many calories and much money by letting me know which products are worth it! I love making homemade pumpkin chocolate chip cookies. Oh my word!!! I was pleasantly surprised by the Pumpkin Cheerios. Great flavor!! I love pumpkin spice latte. I love the pumpkin pancakes from your recipe and pumpkin muffins! I like pretty much any pumpkin cookie or baked good. I have never heard of a lot of these! I do like the pumpkin cheerios though. Chocolate chip pumpkin cupcakes with cream cheese frosting is my fave! I went out and bought that Noosa pumpkin yogurt and it was amazing! I am a pumpkin fanatic. My favorite is pumpkin spice cupcakes with cream cheese icing. I love pumpkin! I buy tons of extra cans when they are in abundance so that I can make pumpkin desserts all year round. My husband doesn’t enjoy pumpkin so it is really hard not to go overboard. I love to make pumpkin cookies the most, I found a good pumpkin pie recipe, I have a family recipes of a pumpkin roll and pumpkin cake and I love a recipe of pumpkin french toast which I found off of pinterest. I also made your pumpkin shake! I would have to say the pumpkin cookies are my favorite because they are the fastest to whip up to satisfy the pumpkin cravings. I will be sure to try a couple store bought pumpkin flavored things. I have never done that before but it sounds so fun! My son and I thoroughly enjoyed reading all of your reviews as we love pumpkin spice too (and are grateful for this season)! My son pointed out that you missed one of his favorite: Celestial Sweet Harvest Pumpkin tea. We have been trying the TJ’s products and we all enjoy the pumpkin bagels. I love homemade pumpkin bars with cream cheese frosting. 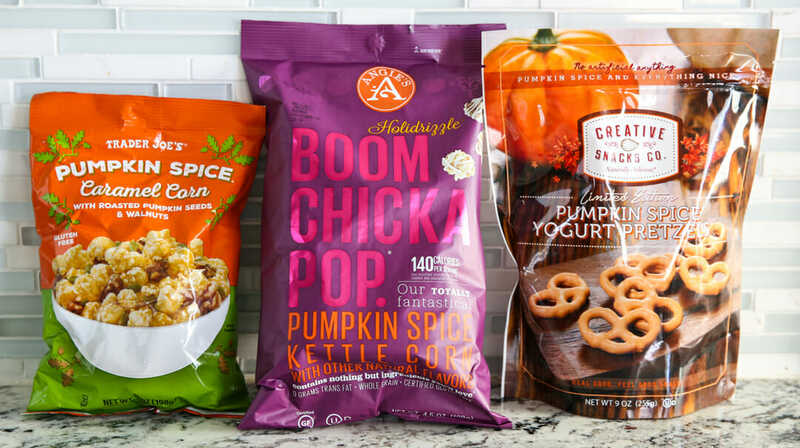 I’m excited to try some of your pumpkin favorites from this post! I have a recipe for pumpkin pancakes that is super yummy. It’s supposed to be from some fancy hotel, and they are good! My favorite thing pumpkin spice is my yummy pumpkin cake recipe! Noosa pumpkin yogurt is AMAZING!!! I didn’t realize there were SOOO many PS flavored things!!! now I want some of that Brittle!! If you live in the southeast and love pumpkin, you must try Publix’s Pumpkin Pie ice cream. It’s as good as their actual pumpkin pie, but even better because it’s ice cream, lol. I love everything pumpkin spice!! I especially love making homemade pancakes, muffins, donut holes..you name it!! I am one of “the people” too because if the labels says pumpkin spice, I buy it!